Copyright? (1 + 1 + 1 + 1 + 2 + 40 = 46) Test. On this page ... Metcalf, Mills & Austin & Mills, J. Morison, Naisby/Naizby, Thomas Nicholson, North Eastern Marine Engineering, North East Shipbuilders, North of England Shipbuilding, Osbourne, Graham, page bottom (unusual vessel names). Just a name at this moment. Any help you might provide re this shipbuilder would be much appreciated. I add the name to the site as a result of learning that a vessel named Naworth Castle, a barque of 349 tons, was built by 'Metcalf' in 1868. The vessel is now listed below. Ella, a barque built in 1869 by Metcalf (believed to be T. Metcalf), is stated in the Mercantile Navy Lists of 1880 & 1890 to have been built at Ayre's Quay. Names of vessels constructed by 'Metcalf'. As I find them. In a table in build date sequence. Your input would be welcomed. To add to the record. A shipbuilder from Southwick. The 'S. Austin' was one of the members of the Austin family, but I cannot tell you which particular one it was. See here. 'Where Ships are Born' informs us that 'some very fine ships were launched under the supervision of George and John Mills' and they specifically mention Judith Allan in that regard. Derek Holcroft has kindly advised, however, (thanks! ), that George Mills is buried in the churchyard of Holy Trinity Church, Southwick. Located 'probably no more that two hundred yards from the�site of the gates to Pickersgill's shipyard'. The gravestone inscription, which can be seen here, is quite difficult to read. I believe that it states that he died on May 31, 1869 at the age of 64. Names of vessels constructed by 'S. Austin and Mills' and 'George and John Mills'. In due course. As I find them. In a table in build date sequence. Judith Allan, referred to above, used to be modestly detail listed on this page. But having two different lists of vessels built at Sunderland over time, both lists referring to the builder as being 'Austin & Mills', the vessel is now listed with other 'Austin & Mills' vessels - here. Just a name at this moment. Any help you might provide re this Pallion shipbuilder would be much appreciated. For a long time. I have listed Forfarshire, built in 1867, as being built by Oswald. It would seem clear, however, via Lloyd's Registers, that Oswald was not the builder, rather it was built at Pallion by a builder named J. Morison. The vessel is now listed below. Names of vessels constructed by 'J. Morison'. As I find them. In a table in build date sequence. But, it seems that the builder, in fact, built one ship only i.e. Forfarshire as below. A 3-masted composite fully rigged passenger sailing ship. Per 1 (Shaw Savill, Forfarshire), 2 (data & passenger list re 1873 voyage to Wellington, NZ, with 235 passengers), 3 (dates of 6 voyages to NZ), 4 (voyage details, 1875), 5 (see bottom ref. i.e. 4), 6 & 7 (images, ex Trove, Australia), 8 (Miramar, link, you now must be registered to access). 201.9 ft. long, built of teak wood, signal letters HNGP. Built, per Lloyd's Registers, by J. Morison of Sunderland for J. (John) Morison, in 1870 of Fenchurch Street, London. I guess different people of similar if not identical name? In 1873, the ship was sold to Shaw, Savill & Company, & commenced voyages to Australia & New Zealand ('NZ'). However, the Mercantile Navy List ('MNL') of 1880 lists the vessel as owned by Walter Savill of London & registered at Southampton. The vessel apparently had a permanent leak - a leak that was never found & required regular pumping. Forfarshire made six voyages to NZ in years 1873 to 1890, & more to Australia. Was damaged & repaired in 1877. A partial new deck in 1879. In 1882, the ship was transferred to The Shaw Savill & Albion Co. Ltd., of London, registered at Southampton (MNL in 1890). On Jan. 4, 1893 Forfarshire rescued (extreme right column) the crew of Carl, waterlogged & derelict in the N. Atlantic at approx. 34N/40W. The vessel suffered significant damage while en route to Wellington, NZ, in 1894. In 1895, she was sold to the Argentine Republic. It likely was late in 1895, however because in Jul. 1895 the vessel left NZ for London. She may have ended her days as a hulk on the Thames river, however there is doubt as to the accuracy of the data. Off the registers in 1896. A friend of the site has forwarded 3 pages of Spanish text & an image (here, enlarged) data that he referenced Forfarshire, & apparently originated at Histarmar. If I understand the material correctly, the hulk, then named Gulfo Nuevo was used to store gunpowder likely at Buenos Aires. In 1910 or 1911, the vessel, described as a 'pontoon powder-keg', caught fire & sank when loaded with 60 tons of gunpowder. It may have been moored at Lord Ambrosio Canale, Z�rate Park. I cannot find the material at Histarmar. The documentation does not refer to Forfarshire. Maybe this is, however, what finally happened to Forfarshire. Need help! Can you help with more data? Or correct the above. I have added in the above builder names not because I know much about them, but rather because I spotted that one of the vessels that had been recorded later in the site as being 'builder unknown' was in fact built by 'Naizby'. We need your help to learn more about the above names. That said, I have seen & thank this site (75% down), which records Wm. Naisby (1841) and/or Wm. Naizby (1847 thru 1867) as a Hylton shipbuilder. Stated to have been at High Ford Dockyard, a site occupied in 1863 by Reay & Naisby (we are asked to note the changed spelling), & later occupied by John Wigham & Sons Ltd. Located just east of the ferry. A 3 masted barque. 128 ft. 0 in. long, signal letters QBWL. Vessel not listed at Miramar. I am grateful for the information provided by eBay vendor scott-base. Whose expired listing advised that the vessel was built in 1860 & owned by J. Clay of Sunderland. The Mercantile Navy List of 1870 states J. J. Clay. In 1879, the vessel was sold to A. Wilhelmsen, of Norway (no name change). In 1880, the vessel was stranded at Lyskil, Sweden, but was later refloated. Out of register in 1896. Can you add anything? There is, I learn, a brief reference to the builder in an 1892 book entitled 'Sunderland: A History of the Town, Port, Trade and Commerce', written by Taylor Potts. Available here as a 'Google' book, the text re Thomas Nicholson can be read below & seen in its original form here. Had his shipbuilding yard and graving docks in Bishopwearmouth-Panns, they were known as Nicholson's docks. Mr. Nicholson lived in the large double three-storied house in Panns, standing a short distance back from the line of street, with railings in front and stone steps up to the doorway, on each side of which were round pillars; the house almost faced the gates of the shipbuilding yard and docks. In 1798 Mr. Nicholson bought the large house at the south-east corner of the Green from Teasdale Mowbray, and removed from the Panns to the house on the Green. In the year 1799 Mr. Nicholson obtained permission to enclose the Green under certain specified conditions. See "grant de novo." Any visitor who so wishes can access the book via the link above & find 'Grant de Novo' after page 324 at the end of the book - in the Appendix. So far as I can see, Thomas Nicholson built 31 vessels at Sunderland in the period from 1768 to 1811. Just to record that a c.1910 book, of 76 illustrated pages, was sold via eBay on Jul. 19, 2011 - about the company which had workshops in both Wallsend-on-Tyne & Sunderland. Specializing, in 'installations of boilers, pumps and other marine engineered items'. It would be good to be able, someday, to show every page of the book within these pages. The company was later renamed 'The North Eastern Marine Engineering Company (1938) Limited', it would seem. In late Nov. 2012, a colour lithograph was offered for sale on eBay by eBay vendor 'oldcasion'. Do drop by his eBay store, which is here. A lithograph of very great beauty - a plan and coloured diagram of a compound surface condensing engine constructed by 'The North Eastern Marine Engineering Company Ltd.' from the patent designs of Mr. William Allen, Managing Engineer. Published, it is believed, folded, as a supplement to 'The Engineer' of Jun. 9, 1871. The engines were for installation in steamships Singapore, Canton & Hong Kong, none of which ships were built at Sunderland. The lithograph was large - 75 x 47 cm. or approx. 29 1/2 x 18 1/2 inches. in size. We offer next a composite of the eBay listing images. Hopefully it will be possible, some day, to provide for your interest & enjoyment, a good large scan of the lithograph. 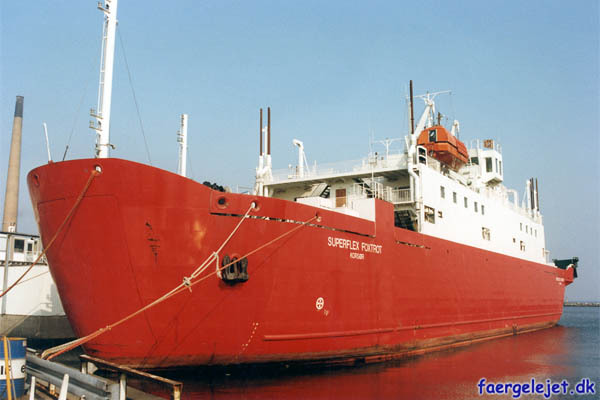 The company which was the result of the 1986 merger of Austin & Pickersgill Ltd. & Sunderland Shipbuilders Limited. Accurate data is needed! Tony Frost advises (thanks!) that 7 ships were built at their Southwick facility, specifically hull #'s 3002, 3004, 3006, 3008, 3010, 3012 & 3014. With names as listed at Miramar. And many more at their Pallion facility. It used to be that you could click on the link that follows & get to the relevant Miramar page. But no longer! The new procedure must be to go to Miramar (here) & log in (you must be registered to view any page). And once you are logged in, return to this page & the following link should work for you:- here. In a guestbook message here 'Southern mackem' advises that the company also built 'a relatively small linkspan'. Such construction clearly related to their building of ferries - since a 'linkspan' is, I learn, the term used for the means by which vehicles drive onto and off a ferry ship - essentially a hinged bridge designed to accommodate changing tides etc. There are a number of quite different types of 'linkspan' all with the same basic purposes. The 'linkspan' that they built was presumably for use by one of the many ferries that they constructed. Names of vessels constructed by 'North East Shipbuilders Ltd.' As I find them. In a table in build date sequence. A passenger & vehicle ferry, initially double-ended, but later rebuilt as a conventional ferry. Per 1 (page in Swedish, that used to have 13 images), 2 (link 1 translated by Google), 3 (image, Pantokrator, best viewed in Photo Viewer), 4 (images galore, Pantokrator), 5 (18 images, Pantokrator, by Stefano Guarino), 6 (data & images, Pantokrator), 7 (Miramar, link, you now must be registered to access). 95.81 metres long, speed of 12 1/2 (or 14) knots, signal letters OZCF later SYOZ & PMSI. Built for 'V R Shipping ApS', (now 'VR Nyborg-Korso ApS'), of Kors�r, Denmark, to provide ferry service between Helsing�r, Denmark, & Helsingborg, Sweden. But, if I understand 2 correctly, it never served under the Danish flag & was used for spare parts. Can that possibly be so? The vessel was sold twice, in 1994, it would seem - firstly, in Jun. 1994, to Melalohari Hellenic Tugboats, of Piraeus, Greece, & later that year to 'Aghios Spyridon Shipping Co. Ltd.' ('Spyridon'), also of Piraeus, & renamed Pantokrator. Presumably named for Mount Pantokrator (the word means 'almighty') the highest mountain on Corfu at 906 metres. For operation by 'Feax Express Lines'. The rebuilt ferry commenced ferry service from Igoumenitsa, on the W. coast of mainland Greece, to the Island of Corfu, also Greece. 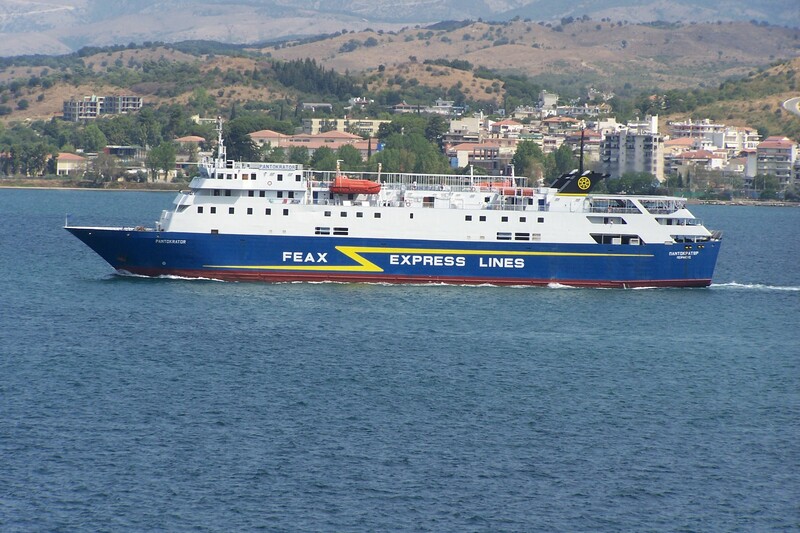 Is 'Feax' the operating name of Spyridon? The vessel was towed from Copenhagen, Denmark, to the 'Kynossoura Dock Yard Ltd.' yards at Salamis, Greece, & rebuilt in the late94/Aug.96 period, a rebuild that took 20 months & cost about 5,000,000 euros. It became a conventional ferry (single ended), 109.2 metres long & 3,042 gross tons. The passenger capacity was increased, it would seem, from 303 to 1,000. No change in auto capacity - 170 cars before & after the rebuild. The engines were changed from Cummins to Alpha or MAN (can anyone provide the detail in English), & its service speed became 18 knots. A number of sites refer to 'lanemetres' with a value of 290. Can anyone explain what that means? 290 metres of lane length would surely not seem to be sufficient for 170 cars. The appearance of the vessel was changed dramatically. Now images as Superflex Foxtrot seem to be most scarce - it would be good, in a single image & in quality, to show the vessel both before & after the conversion. Can you provide a good image of Superflex Foxtrot for that purpose? Was dry docked at Perama, Pireaus, in Mar. 2006. The vessel was still on the Corfu run until early 2013 when it was sold (date of sale?) to 'Panca Merak Luas Samudera', of Surabaja, Indonesia. It would seem that the vessel name was not changed. What is its status now, I wonder? Now most WWW pages are in Greek or Swedish & WWW translation of those pages into English is most difficult. Can you provide more info and/or correct the data above? Just a name at this moment. Any help you might provide re this shipbuilder would be much appreciated. All I have seen is that the yard was at Pallion. A vessel list? (just 12 vessels it would seem, the first vessel being numbered #100). It used to be that you could click on the link that follows & get to the relevant Miramar page. But no longer! The new procedure must be to go to Miramar (here) & log in (you must be registered to view any page). And once you are logged in, return to this page & the following link should work for you:- 111 (12). A cargo ship, rigged as a 2-masted schooner. Per 1 (1885 ref. to launch, p.132/3 & ref. to trial run on p.221), 2 (NY Times archive re 1887 sinking), 3 (Bristol City Line, Wells City #1), 4 (1902 explosion), 5 (Michigan Steamship ref. ), 6 (Miramar, link, you now must be registered to access). 270.0 ft. long (82.3 metres) - between perpendiculars?, signal letters KFCN. Built for Charles Hill & Sons, of Bristol (Bristol City Line) & intended for their Bristol to New York service. Cost $150,000. The christening ceremony was performed by Miss Hill, daughter of the senior owner. Captain T. L. Weiss her first Captain. During her trial run on Dec. 22, 1885, the vessel ran the measured mile at 11 1/2 knots. On Feb. 10, 1887, with Captain Weiss in command, the vessel was anchored off old Pier No. 56 in the North River at New York, (Hudson River) with a cargo principally of tin plates & sheet iron. A giant ice flow unexpectedly appeared & hit the vessel causing her to drag her anchor. The vessel could not be controlled & she crashed heavily into Lone Star, which was modestly damaged. Wells City suffered a big gash in her side, & sank stern first opposite the Hoboken ferry at Christopher Street. A total loss & fully insured. Nobody was considered to be at fault. Bristol City Line abandoned the vessel, which was salvaged & presumably repaired, for later in 1887, it became owned by New York & Yucatan Steamship Company, of New York, & renamed Progreso. In 1902, the vessel was owned by Michigan Steamship Company. On Dec. 3, 1902, when the vessel was lying at the wharf of the Fulton Iron Works at Harbor View, San Francisco, in process of being converted from coal to oil burning, one of the oil tanks blew up, & the ship sagged in the centre ('she had broken in two'). The resulting fire burned for many hours. 12 men were initially missing & 'a score were more or less seriously injured'. The total damage was valued at $200,000 including the vessel at $175,000. The vessel was broken up. Can you add anything? An iron barque. Per 1 (1869 ref. to Beynon), 2 (Beynon, p.184/7, 90% down), 3 (Miramar, link, you now must be registered to access). 231.0 ft. long (70.41 metres) - between perpendiculars?, signal letters KFPT. Likely used to carry coal. Built for T. Beynon & Company, of Newport, Wales. There are a few WWW ref. to Thomas Beynon, who described himself in 1876 as 'a shipowner and coal merchant'. In early 1870 at least, he was the Mayor of Newport. Anyway, it would appear that Beatrix was the very last ship built by the shipbuilder. Miramar advises that Beatrix came to its end in the 1890s, on fire on Sep. 19, 1893. At 46.16S/77.19W, which is off the coast of southern Chile. Have not read the circumstances anywhere, indeed WWW data about the vessel is essentially non-existent. Can you add more? Just a name at this moment. Any help you might provide re this shipbuilder would be much appreciated. All I have seen is that the yard was at North Hylton. This site, 50% down the page, advises that 'Osborne Graham opened in 1871. They were the last firm left building ships at Hylton and survived until 1925. There was an Edwin Graham building in 1873 but unsure that he was connected with the later company.' That page names 4 specific vessels built by the yard in 1892, not already listed below (Gerto, Miramar, Hindustan & Aureola) and lists the yard shipbuilding tonnage in the years of 1883 through 1892. Hindustan is, in fact, now covered on site here. I have read that the yard built sailing vessels, steam coasters & colliers. Was idle for many months in 1885. And suffered industrial action in 1911. Alan Johnston has reminded me that data about the yard is available at Grace's Guide here. Which data includes the fact that in 1931 the yard was purchased by National Shipbuilders Security. And was demolished. Names of vessels constructed by 'Osbourne, Graham'. As I find them. In a table in build date sequence. A cargo ship which became a Navy stores ship. Per 1 (data), 2 (page bottom, Wye), 3 (a modest image at Ascension Island, in the period 1905/1908), 4 (Miramar, link, you now must be registered to access). 222.0 ft. long, speed of 10.4 knots. The vessel was launched as Montreal. Built for A. McMillan & Sons, of Liverpool, as Lancelot. But the Admiralty bought it in Dec. 1873 when it was completed & renamed the vessel Wye. It is puzzling, however, that the vessel was recorded, as Lancelot, in Lloyd's Registers of 1874/75 & 1876/77. Commissioned at Chatham on Apl. 15, 1875. The vessel served in the Mediterranean in 1879. On Nov. 20, 1879, the vessel was commissioned again (status changed perhaps?) at Sheerness. Served in the Mediterranean in 1886 (Brindisi, Suda Bay (Crete), Malta). 1 details a 1900 voyage to W. coast of Africa; & states that the Navy disposed of the ship in 1904. But that data clearly is incorrect, thanks to Richard Lewis. Who provides the 2nd image at left, which demonstrates that the vessel was paid off, at Sheerness, on Sep. 12, 1905. On Apl. 3, 1906, the vessel was sold to Adrienne Merville, of Dunkirk, France, to be broken up (1906 data from an expired eBay item, which data seems to make sense in view of Richard's 1905 data). But ... the modest image at 3 is from an album by Captain R. H. Morgan, who was, I am advised, the Royal Marine Commandant of Ascension Island in 1905-1908. Image perhaps dates from 1907, a date that seems to be suspect. Not a lot of data, all said & done. Richard adds that in the 1899-1901 period, when Richard's grandfather served aboard the vessel, the ship made several voyages calling at such ports as Portsmouth, Plymouth, Madeira, Las Palmas, Sierra Leone, Bahia, Rio de Janeiro & Ascension Island. Miramar indicates (thanks!) that the vessel was broken up at Dunkirk. Can you provide more? An iron barque. Per 1 (wreck summary), 2 (extensive, Jul. 17, 1907, wreck report, cols. 3/5), 3 & 4 (re Court of Enquiry), 5 (image, Woollahra. Ex B), 6 (ex 'The Colonial Clippers' by Basil Lubbock), 7 (Miramar, link, you now must be registered to access). 202 ft. 4 in. long, 61.7 metres perpendicular to perpendicular, signal letters WNKF. The webmaster has a few editions of Lloyd's Registers available ex Google books, thru 1889/90 - see left. Woollahra? An eastern suburb of Sydney, New South Wales ('NSW'), Australia. Built for Cowlishaw Bros., of Sydney. The vessel 'had a very fair turn of speed'. In her later years, she carried coal from Newcastle, NSW, to San Francisco. The vessel would seem to have been later sold. In that regard, I read that a postcard image of the ship exists at Launceston Library, Tasmania, along with an article 'the barque Woollahra sold'. That image may well however be the image now visible at left. In 1907, the vessel is said to have been owned by 'Woollahra Ship Company', of Sydney. In early Jul. 1907, the vessel was at Wellington, New Zealand ('NZ'), delivering a cargo of coal ex Newcastle. Just before midnight on Jul. 14, 1907, while en route, in ballast, from Wellington, to Kaipara (NW of N. Island, NZ), to load kauri lumber for Sydney, the vessel ran aground on ragged rocks 200/250 yards from shore, at Tongue Point, 4 miles SE of Cape Terawhiti (the southwesternmost point of the N. Island), in the Cook Strait. During a rainstorm with heavy seas running. Orders were given to get the lifeboat out, but the forward davit gave away & the lifeboat disappeared, (or alternatively, at 1:30 a.m. on Jul. 15, 1907, the mizzen mast carried away, resulting in the destruction of the lifeboat). At about 5:00 a.m. (or maybe at 4:00 a.m.), with seas breaking over the heavily listing vessel, most of the crew took to a dinghy, which then was destroyed 60/70 yards off shore. Some crew members made it safely to shore carrying ropes & with those ropes all aboard made it to shore, wading thru shallow water. The Captain, Albert M. (Molkin) Andreson, determined to stay aboard the wreck & paid for that decision with his life. Two other crewmen stayed aboard also, and/or maybe missed the departure of the dinghy - McNaughton & William Konig (who could not swim), both able seaman. They jumped into the sea & tried to make it to safety - but only Konig made it to shore. So 2 lives were lost. The vessel? It broke its back, was totally destroyed in the pounding seas, became 'matchwood', & ended up in small pieces all over the beach. The ship could not however have all become matchwood since the wreck is today described as 'one of Wellington's more complete wrecks about 30m offshore in a small bay, inshore of the Karori Rock light'. Duco, a tug from Wellington, just 16 km. distant, arrived on the scene on the afternoon of Jul. 15, 1907, but there was nothing left to which they could offer assistance. The Court of Enquiry, held Jul. 19/20, 1907, found that 'the cause of the casualty was an error of judgement on the part of the master as to the position of the ship when the wind shifted ...'. Can you provide more data? Another image? That 'sale' article? A 'three-masted iron barque carrying royals over single topgallant sails'. Per 1 (data, Gwrtheyrn Castle), 2 (extensive data, Gwrtheyrn Castle), 3 (data, Gwrtheyrn Castle), 4 (image as Ira), 5 (1922 image as Ira, page in Finnish), 6 (Aug 13, 1906 voyage #16), 7 (1922 sale), 8 (Miramar, link, you now must be registered to access). 191.7 ft. long, signal letters PJRN later VMKN. Built for Robert Rees ('Rees'), of Caernarvon (or Nevin or Nefyn), Wales. In 1881, the vessel was sold to R. Thomas & Co. of Nevin (later of Criccieth, Wales & Liverpool). (However 'Mystic Seaport's 'Record of American and Foreign Shipping' lists the vessel as being owned by Rees until 1900 in which year R. Thomas is named.) In 1905 it was sold again, to Antonio Gotusso, of Portofino, Genoa, for �2,025. Lots of detail at 2 of voyages in the intervening years including twice round the Horn. In Apl. 1913, the vessel was sold to 'Jakobstads Rederi Ab', of Jakobstad, Finland (K. Strom the manager) & renamed Ira. In Oct. 1914, the vessel was laid up in Jakobstad, & 'sold during the war' to 'Oy Tonnage Ab', of Raumo, Finland. The next data conflicts. a) In 1922 the vessel was sold to Scott, Fell & Co. of Sydney, New South Wales, on behalf of the Southern Coal Owners' Agency, who renamed her Gwrtheyrn Castle. Or b) in 1923, th vessel was acquired by Interstate Steamship Company ('Interstate') established in 1920 by William Scott Fell ('Fell'), of Sydney, New South Wales, Australia. Ownership by Interstate is not recorded in the 1924 Lloyd's Annual Ship Register. Fell became part owner & Chairman of Gretamain Colliery Limited in Newcastle, NSW, in 1923. In 1923, the vessel was rebuilt for use as a coal hulk in Sydney, NSW, & was still a hulk there in 1929. Became Castle, I am advised (by Mori Flapan), before 1933. Can you provide more info? An iron 3-masted fully rigged ship. Per 1 (modest image), 2 (1882 arrival at Sydney, Australia), 3 (data 40% down), 4 (data re Krakatoa eruption), 5 (Empire Line), 6 (Miramar, link, you now must be registered to access). 267.2 ft. long (81.4 metres) - perpendicular to perpendicular per Miramar), 3 sky-sails, signal letters RBGM. Built for G. Duncan & Co., of London, (Empire Line), & registered at London. J. (John) Duncan was her Captain for an amazing number of years - from 1877 to 1907. An article in 'Sea Breezes' (not sure which issue) would seem to have referred to Captain Duncan's death. Then (in 1907) 'G. Rochester' became her Captain. It would seem that on Jan. 15, 1907, while en route from Montevideo, Uruguay, to Wallaroo, South Ausralia, in ballast, the captain of Celestial Empire died & was buried at sea - but that captain proved to be Captain Cantley, whose wife was likely aboard & at his side. There are a great many newspaper articles referring to the vessel at Trove, Australia, often carrying coal or wheat. Including a few articles re major storms that the vessel encountered at sea (1891 & 1904). The vessel was broken up in Q2 of 1911. Can you add anything and/or correct the above? A 3-masted iron barque. Per 1 (data), 2 (New Zealand article, Inga, at bottom), 3 (Great Storm of 1901 & Inga wreck account), 4 (Miramar, link, you now must be registered to access). Their used to be data re 'The Great Storm of 1901' & Inga at the website of 'Local History Initiative' - but that website is no more. One of their pages was a Word document re Inga, a page that survives as the first item at 1 & here also. 204.6 ft. long (62.36 metres) perpendicular to perpendicular, signal letters QMWS (apparently later JDNB). Built for North Wales Shipping Co. Ltd., of Carnarvon (now Caernarfon), Wales. The webmaster has a few editions of Lloyd's Registers available ex Google books, thru 1890/91 - see left. In the 1887/88 edition, the owner became 'Gwynedd Shipping Co. Ltd.', of Nevin, (now Nefyn perhaps), North Wales, with W. Thomas & Sons, the managers. I read that the vessel was sold to Robert Thomas of Criccieth, Cardigan Bay, Wales. In 1899, the vessel was sold to 'Acties Inga', T. B. Heistein the manager & likely the owner also, though Miramar state T. (Thv.) B. Olsen, of Kristiansand, Norway, & renamed Inga. In late 1901, the vessel was en route from Port Wakefield, near Adelaide, South Australia, via Falmouth, to the Tyne, with a cargo of grain. The Captain was T. A. Olsen, with a crew of 16 & also 2 boys, both relatives of the ship's owner. At 4:30 a.m. on Nov. 13, 1901, the vessel was within a mile N. of safe harbour at the River Tyne, when the ship was blown by high winds onto the rocks at the N. end of Long Sands, Cullercoats, North Tyneside. A casualty of 'The Great Storm' of Nov. 12/15, 1901 which hammered many parts of U.K. but particularly sank 46 ships between the Tweed & the Tees with the loss of 200 lives. With Force 11 winds, almost a hurricane. The vessel heeled over & all aboard were thrown into the raging sea. The sea was just too rough to even launch the Cullercoat lifeboat. Attempts was made, however, by the Tynemouth Volunteer Life Brigade, to effect a rescue with shore-based rocket apparatus but they were not successful. Just one crew member, Andreas Birkeland, (or maybe Andres Barklund), survived. He was washed ashore wearing a lifebelt. The wreck has, I read, been identified, lying 400 yards offshore, in about 6 metres of water. I learn that a parcel from the ship was found on the beach by one Robert Hudson. It contained two photographs, one of the Inga herself & one of the crew on the deck (both images are at left). Hudson gave them to the Tynemouth Volunteer Life Brigade, who retain them in their archives to this very day. Can you add anything or correct the above? An iron barquentine, later a brig perhaps. Per 1 (ref. 70% down 'April 24 1880'), 2 (1901 wreck report), 3 (Alexa Wreck Inquiry, ex 4), 5 (Miramar, link, you now must be registered to access). 144.3 ft. long (43.98 metres) perpendicular to perpendicular, signal letters RSBW. The webmaster has a few editions of Lloyd's Registers available ex Google books, thru 1889/90 - see left. Built for G. Turnbull & Co., of Wellington, New Zealand ('NZ'). There are a few references to vessels named Alexa, including a brief reference to an Apl. 1880 arrival (1) at Port Chalmers, NZ. In the 1887/88 edition of Lloyd's Register, the vessel, then owned by D. H. McKenzie, of Auckland, NZ, is recorded as sold to C. A. Harris Jr. ('Harris'), also of Auckland. And in the 1889/90 edition, Harris has sold the vessel again, to W. S. Waterson, correctly Waterston, of Invercargill, NZ. In expired eBay items, I have read that in 1895, or maybe in 1900, the vessel was re-rigged as a brig. However I can spot no references to Alexa being a brig. I would however need access to Lloyd's Registers to better know what the facts are. On Dec. 26, 1898, Alexa, described as a barque, collided with the Pyrmont swing bridge while going up to Darling Harbor, Sydney, & carried away some of her head gear. The vessel was described as being a 'Pacific Trader' - in the China/Singapore/NZ trade. On Jul. 7, 1901, the barque, chartered to load phosphates, in ballast, & under the command of W. (William) Woebling, hit hurricane conditions & was driven on to a reef at Surprise Island, in the Chesterfield Group (New Caledonia in the South Pacific, between Fiji & the E. coast of Australia). The crew of ten took to the only usable boat & with difficulty effected a landing, while the vessel itself broke up. Some of the crew made it to Caledonia in that Alexa boat, while others found a boat that had drifted ashore from another vessel (Vincennes, a barque) & used it in an attempt to make it to Noumea. After seven days at sea, they were rescued by St. Pierre, a steamer sent to search for them. The mate returned, however, to the wreck to protect the owner's interests. So no lives were lost, it would appear. The Court of Inquiry determined, only on the evidence provided, that the captain had exercised due care in the navigation of Alexa & had been misled by the incorrect reference on the charts as to the speed of the currents in the area. They noted however that their decision was based upon the captain's evidence & that the 1st mate was not present at the Inquiry, to give his evidence. Can you add anything and/or correct the above? A cargo ship. Per 1 (1881 ref. ), 2 ('wrecksite.eu', 1909 collision & loss), 3 (Miramar, link, you now must be registered to access). 240.0 ft. long (73.15 metres), signal letters SJCN. Built for William A. Watson & Co., soon W. A. Watson, of Sunderland. I read that new boilers were fitted in 1891. Colin Walker advises (thanks) that in Apl. 1897, his grandfather Henry Walker, of Wear Street, Sunderland, was found dead in the ship's hold, covered with coal, when it docked at Rochester, Kent, after arriving from Sunderland. Found with a whisky flask in his hands. A family tragedy at the time, no doubt. But a story not devoid of humour, read 112 years later! There is, however, rather more to the story. On Sep. 22, 1909, while en route from Hamburg, Germany, to Seaham Harbour (now Seaham, 6 miles S. of Sunderland), the vessel was in collision, in the vicinity of the Dogger Bank in the North Sea, with Direktor Reppenhagen, built in 1893. The City of Rochester sank as a result of the collision. One crewman was lost - Stewart Robson. The survivors were landed, (by Direktor Reppenhagen perhaps? ), at South Shields. WWW data about the ship is most limited. Can you provide more info? A 3-masted iron barque. Per 1 & 2 (William Thomas & Co., but neither page refers to Eivion), 3 (image), 4 (Robert Thomas, Eivion), 5 (Lonsdale, Sea Gallantry awards), 6 (Spanish page, fire, Lonsdale), 7 (transcription of the Report of the Naval Court at Valparaiso), 8 (Miramar, link, you now must be registered to access). 211.1 ft. long (64.3 metres) perpendicular to perpendicular, signal letters SNPR. Built for North Wales Ship Co. Ltd., of Caernarfon (Carnarvon), Wales. In 1887, the vessel was sold to William Thomas & Co., of Liverpool & Anglesey. And a company "Ship "Eivion" Company Ltd.' was formed, presumably to own it. In 1894, the vessel was sold to Robert Thomas (R. Thomas & Co.) of Criccieth, Wales. On Jun. 14, 1904, the vessel left Garston, Liverpool, for Tocopilla (in northern Chile) with a cargo of steam coal, with Robert Thomas in command & a crew of 19 all told. On Sep. 10, 1904, during heavy weather, the lifeboat & gig was washed away. On Sep. 30, 1904, smoke was noticed forward, & three hatches were battened down including the ventilators, presumably hoping to starve the fire. It did not work. At midnight on Oct. 1, 1904, the vessel's fore-hatches were blown off & overboard &, at 6:15 a.m. on Oct. 2, 1904, the after-hatches were also blown off. The only remaining boat was stave in at 3 p.m. that day as the ship rolled in the heavy weather. Fortunately Lonsdale of Liverpool, a fully rigged ship of 1685 tons, came into sight & some 7 1/2 hours later came close & stood by. Explosions continued, occurring with each roll of the ship. All of this at approx. 54S/84W, near Cape Horn (S. tip of South America). At 6:30 a.m. on Oct. 3, 1904, Lonsdale launched a lifeboat under the command of first mate J. O'Connor manned by 4 brave volunteer crew members. That boat was smashed against Eivion's side by the fury of the sea, staving in the boat & filling it with water. I presume, however, that it was not totally smashed since it managed to return to Lonsdale with ten of the Eivion crew & indeed would seem to have returned a second time to rescue Captain Thomas & the remaining Eivion crew. By that time, all of Eivion's hatches were off & dense clouds of smoke were rising from each hatch. The ship was clearly sinking, the weather was further deteriorating. Lonsdale later landed the survivors at Talcahuano (coast of Central Chile). All 5 crew members of the Lonsdale lifeboat were awarded prestigious Sea Gallantry Medals for their rescue efforts. A wreck of a vessel of the same name lies at Rye, near Melbourne, Victoria, Australia, but it is not the wreck of this vessel. We thank author Cathy Woodhead for providing a major portion of the above data. Can you correct my text and/or provide more info? An iron barque, which was launched in Oct. 1881. Per 1 ('wrecksite.eu', wreck data), 2 (data & modest image at link), 3 (ex this large 'doc' file in Norwegian, Akaroa at ref. #412), 4 (data), 5 (vessel at Port Chalmers, New Zealand, in Mar. 1884), 6 (U-19), 7 (at page bottom, Patrick Henderson Line), 8 (Miramar, link, you now must be registered to access). 221.0 ft. long, signal letters WFKH later KBRQ. Built for 'Shaw, Savill & Co.', of London. In 1882, the vessel was transferred to 'Shaw, Savill & Albion Co. Ltd.', of Southampton, who owned it, per Lloyd's Registers, thru 1889/90. (But link 2 states originally owned by Patrick Henderson & Co. of Glasgow). 12 voyages to Australia perhaps. 3 voyages to Australia (& possibly New Zealand) & one trip to Cape Colony, South Africa, between 1899 & 1903, under the command of Captain R. A. Kelly. In 1904, the vessel was sold to Norwegian owners. 3 says to 'A/S Akaroa (Jens M. A. Marcussen, Asker�en), of Ris�r', Norway, while 1 says to Englehart Steam Ship Co. In 1908/09, per Lloyd's Register, the vessel was owned by 'Acties. Akaroa' (J. M. A. Marcussen), of Risor. In 1913, was registered at Asker�en? On Jan. 9, 1917, while en route from Philadelphia, U.S.A., to Rouen, France, with a cargo of machine oil & grease, the vessel was hit by 3 torpedoes (& maybe gunfire as well) fired by U-19, Kapit�nleutnant Johannes Spie� in command, at 49.21N/04.25W, west of the Channel Islands. And sank. It would seem that U-19 hit the hull of Akaroa & lost its periscope. The entire Akaroa crew, in 2 lifeboats, safely reached the coast of France after 36 hours, so no loss of life accordingly. Can you provide more info? Lloyd's Register data, perhaps, to confirm the registered ownerships. An iron cargo ship. Per 1 (1882 launch, Cornucopia), 2 ('wrecksite.eu', Cornucopia), 3 (Wreck Inquiry, Cornucopia), 4 (Miramar, link, you now must be registered to access). 251.0 ft. long, two masted, schooner-rigged, signal letters WPMH. Christened by Mrs. Potts, wife of Captain Potts, presumably of Turnbull, Potts & Co. The webmaster has a few editions of Lloyd's Registers available thru 1890/91 - see left. The launch reference above would seem to indicate that the vessel was built for 'Argosy Steam Shipping Company Limited' ('Argosy'), with 'Turnbull, Potts & Co.' ('Turnbull'), of Sunderland, the managers. It would seem however that the initial registered owner was, in fact, Turnbull. By the 1887/88 & 1889/90 editions of Lloyd's Register, Argosy had, however, become the stated owner with Turnbull the managers. In 1895, the vessel was sold to W. M. Holby, & renamed Astrid. I have seen references to W. M. Holby being of Christiania, i.e. Oslo, Norway. Can anybody confirm that? It would seem that Metcalf Motor Coasters Ltd., of London, owned the vessel in the 1894/95 period, but it would seem that they (T. Metcalf) were rather the vessel's managers. A new boiler was fitted in 1896. In 1900, the vessel was renamed Cornucopia, when re-sold, for �11,000, to her previous owners, which likely means Argosy. A snippet reference in 'Record of American and Foreign Shipping' states that J. & P. Hutchinson were the vessel's owners in 1907. 2 states that 'Gunderson Christian & Co.', of Oslo were her final owners, however the Inquiry report rather states that Thomas Holt Hutchison, of Glasgow, was her managing owner in 1910. The entire vessel was thoroughly overhauled in Feb. 1910, by 'Ailsa Shipbuilding Company, Limited' at a cost of �2,764 7s. 6d. On Dec. 9, 1910, the vessel left Swansea for an unstated destination with a cargo of anthracite coal. Arthur M. (Macdonald) Joliffe was in command with a crew of 20 all told & no passengers. Heavy gales, mountainous seas & hurricane force winds were encountered in the Bay of Biscay, such storms, described by the captain of Rask as the heaviest he had seen in 20 years, lasting 5 or so days. Cornucopia shipped a particularly heavy sea at 1:00 a.m. on Jan. 15 - much damage to the vessel resulted including a 30 degree list to starboard, a list which became even greater as sea water continued to enter the stokehold & cargo. Unsuccessful efforts were made to re-trim the cargo which had shifted in the holds. It became quite beyond the ability of the pumps to control the water levels & of the crew to correct her list. With all of her boats stove in & with darkness approaching, they signalled a vessel that had come into sight at 4 p.m. That vessel proved to be Rask, a Norwegian steamer en route from Glasgow to Barcelona with a cargo of coal. During the next few hours, the ship's list became 40 degrees. One by one, the Cornucopia crew was taken off, with great difficulty, by two lifeboats from Rask, which had spread oil to lessen the seas. Rask left the area at about 9 p.m. on Jan. 15, & on Dec. 20, 1910 the crew were all landed at Gibraltar. All of this at about 45.50N/8.340W, in the N. Atlantic, Bay of Biscay. The abandoned vessel did not immediately sink. On Dec. 17, August Leffler, a Swedish steamer, came upon the drifting ship, & made multiple attempts to get strong lines aboard & to tow her. Twice they succeeded in getting lines aboard but both lines failed. Cornucopia surely sank, on or about Dec. 20, 1910. The court concluded that Cornucopia had not been prematurely abandoned & had been navigated with proper & seamanlike care. Can you provide more info and/or correct the above? Another image? A 3-masted iron barque. Per 1 (Wikipedia), 2 (35% down, with fine image), 3 [Ganges (2)], 4 (Norwegian data, ex an earlier version perhaps of 5 a large 'Skipet' Word file you can download, at #367), 6 ('uboat.net', Asters), 7 (Miramar, link, you now must be registered to access). 241.0 ft. long, signal letters WKBN, later WLCF & WGLJ. Built for J. Nourse, of London. Essentially owned by Nourse Lines from 1882 to 1904, however C. A. Hampton & E. Bromehead, executors of the estate of James Nourse (1828/1897), took control after his death. An 1883 voyage. The vessel made three trips to Fiji, in 1885, 1899 & 1900, with indentured Indian labourers. Also travelled to Suriname in the West Indies in 1889. And to Trinidad in 1890 - maybe for a similar purpose but Wikipedia states carrying 568 'passengers'. On Feb. 19, 1903, the vessel became owned by James Nourse Limited. The vessel was sold, in Feb. 1904, to 'A/S Ganges (R. Salvesen & Co.)' of Tvedestrand, Norway. Have read (in an expired eBay item) that the vessel was sold in 1915 to Loveridge & Olsen, of Stavanger, Norway (can anyone advise if that was so). And sold again, in Jan. 1916, to 'A/S Asters (Thv. B. Heistein & S�nner A/S)' of Kristiansand, Norway, & renamed Asters. The barque was shelled, set on fire & scuttled, on May 28, 1917, by German submarine UC-55, Oberleutnant zur See Theodor Schultz in command, 150 miles NW of the Scilly Islands, when en route from Le Havre, France, to Philadelphia, U.S.A., with a cargo of vegetable oils & waxes. No loss of life though I cannot tell you how the crew were landed. At 49.36N/9.28W or perhaps at 50.00N/07.00W. Can you provide more info? An iron barque, launched on Jun. 10, 1884. Per 1 (artwork, Rosa M.), 2 (Miramar, link, you now must be registered to access). 222.0 ft. long (67.67 metres) perpendicular to perpendicular, signal letters JMCT, later RSNL. Built for W. Just & Co. of Liverpool. In 1896/97, per Lloyd's Register, Bank Shipping Co. Ltd. of Liverpool became the vessel's owners with W. Just & Co. her managers. The vessel made many voyages to Australia. Details of such voyages, thanks to Trove, Australia:- i) the vessel left Middlesbrough on Jul. 17, 1885, William Quinn in command, for Sydney, New South Wales ('NSW'), arriving on Oct. 25, 1885. It went on to Wallaroo (160 km. NW of Adelaide) & on Jan. 19, 1886 left Wallaroo for the U.K. with 1800 tons (over 70,000 bushels) of wheat. But, the first time such a thing had ever happened (due to market prices for wheat) the vessel was recalled (ex here) to Adelaide & the grain sold there. A side trip to Sydney & back. The vessel left Adelaide for Talcahuana, Chile, on Feb. 13, 1885. ii) The vessel left Liverpool on Oct. 30, 1886 for Sydney, arriving there on Jan. 26, 1887. On Mar. 2, 1887 the vessel left for Iquique, Chile. iii) On Dec. 19, 1885 the vessel left London for Sydney arriving there on Mar. 17, 1886. It went on to Melbourne & then to Newcastle, NSW, & left Newcastle on May 1, 1886 for Valparaiso, Chile, presumably with coal. iv) The vessel left London on Mar. 22, 1891 for Adelaide (arrived Jun. 25, 1891). The vessel went on to Newcastle & on Sep. 2, 1891 left for Valparaiso, likely with coal. v) On Nov. 19, 1882 the vessel arrived at Mollendo, Peru, ex Newcastle. vi) The vessel was chartered to carry grain from Lyttelton, New Zealand. On Jan. 20, 1895 the vessel left Lyttelton for London arriving there on Apl. 29, 1895. vii) On May 20, 1895 the vessel left London for Talcahuana, but due to terrible weather encountered en route was unable to reach Cape Horn. The vessel instead went to Newcastle, NSW, & on Oct. 15, 1895 left Newcastle for Valparaiso (arrived Nov. 27, 1895) with 1923 tons of coal. viii) On Dec. 1, 1896 the vessel left Mozambique, East Africa. It arrived at Albany, Western Australia ('WA'), awaiting orders & on Jan. 18, 1897 left Albany for Newcastle, which it departed on Feb. 22, 1897 for Tal Tal (or Taltal), Chile, with 1906 tons of coal, arriving there on Apl. 24, 1897. ix) The vessel left Liverpool on Jun. 23, 1902 for Melbourne where it arrived on Jun. 5, 1902. On Jul. 4, 1902 it left for Tal Tal but arrived at Inquique on Aug. 16, 1902. x) On Sep. 13, 1903 the vessel arrived at Newcastle ex East London, South Africa. On Oct. 9, 1903 it left for Salavery, Peru, with 1948 tons of coal. xi) The vessel left Liverpool on Sep. 5, 1904 & Glasgow on Sep 16, 1904 for Fremantle, WA. It arrived, severely weather damaged, on Dec. 23, 1904. It later left Fremantle for Bunbury & left that port on Mar. 3, 1905 for Delagoa Bay ('DB'), Mozambique. On May 21, 1904 it left DB for Newcastle, was again severely damaged & had to put into Port Louis, Mauritius, to effect repairs. It left Port Louis on Aug. 8, 1905 for Newcastle & on Oct. 28, 1905 left Newcastle for Antofagasta, northern Chile. In 1907 the vessel was sold to 'L. 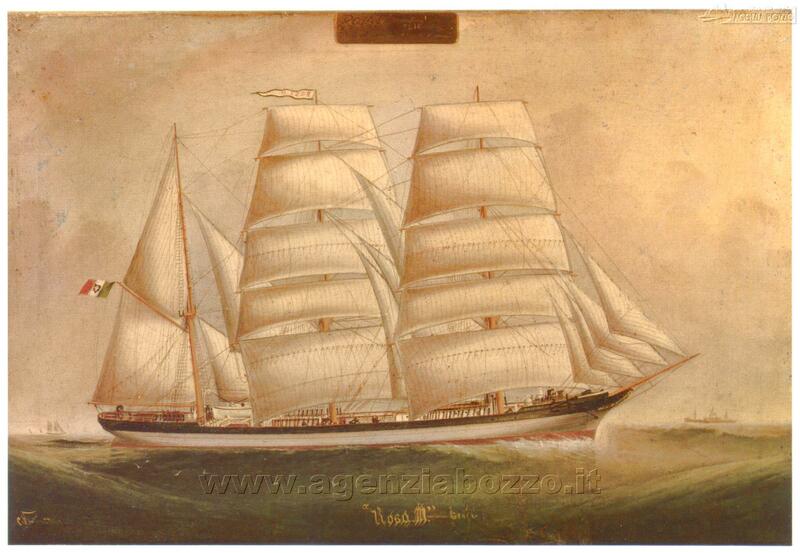 Mortola fu A.A.' of Genoa, Italy, for �3,800, & renamed Rosa M. Mortola was the vessel's captain, I read. On Mar. 21, 1907, the vessel left London for Algoa Bay, South Africa, went onward to Newcastle which it left on Oct. 25, 1907 with coal for Valparaiso. No later references to Rosa M. at Trove that I could spot. Miramar states that the vessel was broken up in Feb. 1922. At Genoa, perhaps. The artwork at left, 61 x 40 cm. in size, was, I believe, painted 'by Vessington' of New York. It came from the 'www.agenziabozzo.it' a web site that was lost but I have found again. Was the artwork a print published by an Italian insurance company? Can you correct my text and/or provide more info? A 3-masted iron barque. Per 1 (Thomas Williams), 2 & 3 (William Thomas & Co., Cambrian Chieftain), 4 (data & fine Mark Myers artwork, Cambrian Chieftain, message #131), 5 (Dee, Sea Gallantry Awards, about 25% down, also 6), 7 (St. Paul), 8 (data ex a 'www.skipet.no' 'doc' file here), 9 (Lloyd's Register data, 1930/31 thru 1932/33, ex 'plimsollshipdata.org'), 10 (1894 'loss' of Cambrian Chieftain), 11 (1894 arrival at Taltal ex 12), 13 (Miramar, link, you now must be registered to access). 230.0 ft. long (70.1 metres) perpendicular to perpendicular, signal letters JTPS, later WJVF. The webmaster has just two editions of Lloyd's Registers available thru 1889/90 & also the 1930s data ex 'plimsollshipdata.org' - see left. Built for Thomas Williams & Co., of Liverpool & Criccieth, Wales. On Jan. 13, 1892, I deduce, the vessel was in collision with the French fishing boat St. Paul. 'The French trawler St. Paul, of Isigny, sank after a collision in the English Channel on Wednesday with the British barque Cambrian Chieftain, of Liverpool. Three fishermen were drowned. The captain and two of the crew were saved by the barque and were afterwards transferred to a trawler and landed at Brlxham'. It would seem that the vessel was 'knocked down' on Apl. 16, 1894, off Cape Horn, while en route from Newcastle, New South Wales, to Coquimbo, Chile, Hugh Thomas in command (crew list - ref. 19 May 1894, almost 50% down) - her cargo of coal shifted and some of her crew, including the Master's wife, were taken off by the barque Dee. Captain Alexander M. Pope was in command of Dee. Indeed 4 of Dee's crew were awarded Sea Gallantry Medals for their rescue efforts. Thought to have been lost, the insurance was paid out in London when news was received of her safe arrival at Taltal, Chile. The first Dee boat rescued 13 persons from Cambrian Chieftain including the Captain's wife & two children. It seems certain that the 5 persons involved in the 2nd Dee boat sent to the rescue of Cambrian Chieftain, including David Belsham in command, were all drowned in the attempt. Henry Thomas may have been sent to Chile to rig & bring home the damaged vessel. After Thomas Williams died, the vessel, in 1896, was sold to William Thomas & Co., of Liverpool & Anglesey. In 1913, the vessel was sold to 'A/S Silva', of Drammen, Norway, 'D. A. Knudsen', of H�len, Norway, the manager, & renamed Dova Lisboa. In 1916, the vessel was registered at Kristiania, i.e. Oslo, Norway. On Jul. 27, 1917, the vessel arrived at a U.S. port, ex Rio de Janeiro, with a case of smallpox aboard. The 19 crew members were all vaccinated & the ship was fumigated. In Aug. 1918, the vessel was sold to Harald Wellen, of Kristiania. And in 1924, the vessel was sold to 'Chr. Lehland-Egelien', of Drammen. In 1924, the vessel was possibly sold to English ship breakers - assuming that 'for hogging' means 'for breaking up'. May have actually been broken up in 1925 at Mobile, wherever that is. But that data seems to be incorrect. A 1933 data snippet advises - The last arrival from Mobile was the Norwegian barque Dova Lisboa, better known to ship-lovers as the old Cambrian Chieftain. She had had a terrible passage across the Atlantic, having lost three men overboard and also lost her bowsprit in collision with a steamer in the Downs, while she was rust-streaked from stem to stern. After discharge, the sadly battered old .... An eBay item has since stated that the vessel was broken up at Sunderland. Per Miramar, the vessel was deleted from the registers in 1933. And indeed it was. In its final three years of Lloyd's Register listing, the vessel, last surveyed in 1924, was stated to be owned by C. W. Dawkin - of where, I wonder. Can you correct my text and/or provide more info? A cargo ship. Per 1 (1885 ref. to launch, p. 221 & ref. on p. 257), 2 (an earlier Dordogne), 3 (brief ref. to Cardiff Steamship), 4 (1918 fire, almost 75% down, ref. 14/15 April 1918), 5 (Miramar, link, you now must be registered to access). 200.0 ft. long (60.96 metres), signal letters KDFR. Built for 'Hooper, Campbell & Co., Managers of the Cardiff Steamship Company' Limited ('Cardiff'), i.e. built for Cardiff. I read that Horatio Hooper was the managing owner of Cardiff, which had other owners also, including William Campbell & A. G. Todd. To trade between Cardiff, Wales, & Bordeaux, France. An earlier vessel of the name, similarly owned, carried coal to Bordeaux twice a month & returned with pitwood or a mixed cargo. The vessel was sold, in 1912, to 'L. Vlahakis' (of Greece, perhaps?) & renamed Nicolaos. And was sold again in 1914 to 'Lapaka & Co.' & renamed Proton. Miramar indicate the end came with a fire in May 1918. Just possibly that should be Apl. 1918 since on Apl. 15/16, 1918, a vessel named Proton, then an ammunition ship with 240 tons of ammunition aboard, caught fire at Port Said, Egypt. The Albert Medal was granted to Commander Walter H. C. Calthrop, R.N., for his 'utmost gallantry and disregard of his own personal safety' in twice boarding (accompanied) the abandoned vessel, ablaze in 2 holds, with 'sides being red hot as far aft as the bridge', to try to flood & eventually to actually blow up the ship. 'His efforts undoubtedly prevented serious loss of life.' Miramar list only 1 vessel of the name in the time period. Can you provide more info? A cargo ship. Per 1 (data, in French), 2 (link 1 translated into English), 3 (Sir Henry Samman, 1849/1928, ['Samman'] & Deddington Steamship Co.), 4 (the Samman fleet), 5 ('wrecksite.eu', Somerton wreck), 6 (1922 image, Sir Henry Samman, 3rd from left, ex 7), 8 (Miramar, link, you now must be registered to access). 290.0 ft. long (88.39 metres), signal letters LHJW. Built for 'The Deddington Steamship Company, Limited', of Hull, owned & managed by Samman, who served as the company's managing director. The company was presumably named after the village in which Samman was born i.e. Deddington, Oxfordshire. Do read here of Samman's lawsuit against W. H. Coysh, previously the Captain of Somerton. It would seem that the captain, the ship's mate & the steward bought 200 turkeys in Smyrna, now İzmir, Turkey, & carried them aboard Somerton to Leith, Scotland. It was then, it would seem, a fairly common practice for Hull captains to import poultry from other countries, with the knowledge of the owners & without having to pay freight. Samman, however, sued Coysh for, amongst other matters, �10 for the carriage of the 200 turkeys. The court found in Samman's favour on the matter but only in respect of the 108 turkeys owned by Coysh, & in the reduced amount of 54 shillings, a little less that �3. On Sep. 26, 1896, en route from New Orleans, U.S.A., to Rouen, France with a cargo of grain, the vessel was wrecked at Fatouville, on the River Seine, France, near Le Havre. During a storm it would seem. Fatouville? A light (phare) on the estuary of the river Seine, between Hofleur & Quillebeuf, a place noted for its strong tides. WWW data about the vessel is modest indeed. Now while we have limited data, we do have, thanks to Agn�s Maleville, of La Bouille, near Rouen, France, some fine images of the ship's bell. At left & here. A very large bell it would seem. Which hangs on a terrace overlooking the Seine River at La Bouille. Doubtless recovered from the 1896 wreck. In 1897, I read, the river authorities demanded the removal of the Somerton wreck. Can you provide more info? An image of the vessel? A cargo ship. Which had a very long life indeed. Per 1 (page in Norwegian, with image), 2 (link 1 translated into English), 3 ('plimsollshipdata.org', Lloyd's Register data, Lona, 1930/31 thru 1945/46), 4 (Miramar, link, you now must be registered to access). 258.0 ft. long (78.64 metres), signal letters LHTR later JSDV & SGNK. Built for James Gardiner & Co., of Glasgow. The vessel was sold, in 1898 or 1899 (the year of sale is confused) to 'D/S Therese A/S' of Sandefjord, Norway, with P. A. Gr�n the managers & renamed Therese. In 1911 the vessel was sold again, to Otto Banck of Helsingborg, Sweden, & renamed Lona. And sold or transferred, in 1921, to Erik Banck, also of Helsingborg with no change of vessel name. It is recorded as 1577 gross tons in Lloyd's Register from 1930/31. It was transferred, in 1937/38, to 'Eric Bancks Rederi' of Stockholm, Sweden, which in 1942 became 'Erik Bancks Rederi AB', also of Stockholm, with Percy Banck the manager. It became recorded as 1596 gross tons in Lloyd's Register of 1943/44. The vessel was sold, in 1946, to 'G. M. Broms Rederi A/B', of Stockholm, with Seth Brinck the manager, again with no change of vessel name. The vessel was sold for the last time, in 1949 for �11,500, to M. Zoboli (who may in fact be only the manager), of Italy, & renamed Egle Z. Does anybody have an edition of Lloyd's Register to clarify the exact ownership? The vessel arrived on Jul. 15, 1954 at Savona, near Genoa, Italy, to be broken up. Alas, I can tell you nothing about the vessel's operational history. Can you add anything? A collier. Per 1 (data), 2 (1920 accident description), 3 (1904 collision), 4 (April 5, 1919), 5 (Miramar, link, you now must be registered to access). 258.0 ft. (78.64 metres) long, signal letter LTQV, 175 HP, named by Miss W. Graham of Hylton at the time of the launch for Black Diamond Steamship Co. Limited ('BlackD') of Montreal, Quebec, Canada. It would seem that the vessel was initially registered in the name of BlackD but in 1890/91 the registered owner became Babcock & Radcliffe, of Liverpool. Owned (or maybe chartered) by Dominion Coal Co., of Glace Bay, Nova Scotia, Canada. Lloyd's Register ('LR') of 1897/98 lists Dominion Coal Co. (Lim.) as her then owner with Kingman, Brown & Co. the managers. On Jun. 12, 1904, as dawn was breaking, Cape Breton rammed & sank Canada (a 'Richelieu and Ontario Navigation Company' passenger ship with 110 passengers aboard) in the St. Lawrence river, 6 miles below Sorel, Quebec. Cape Breton swerved across the path of Canada & her bow struck Canada just forward of the paddle-box on the starboard side. 5 lives were lost. I read that the vessel served on Canada's west coast in 1911/12. In 1913, & in 1919 also, the vessel would seem to have been owned by 'Steamship Carbon Co., Ltd.' of Sydney, Nova Scotia with Dominion Coal Co. Ltd. the managers (certainly from 1911/12 per LR). On Apl. 5, 1919, the vessel's boiler exploded when at Cape Spear, Newfoundland - 5 were killed including the vessel's Chief Engineer & 2nd Engineer. A formal investigation into the explosion was held at Sydney, Nova Scotia - nobody was held at blame, the explosion being caused by 'the weakening of the patch on the centre furnace, and bottom of combustion chamber through corrosion'. Did nobody consider the clear lack of maintenance? On Mar. 7, 1920, the vessel ran aground in a gale at Red Rocks, (SE point of Scatterie (or Scaterie) Island, Cape Breton, Nova Scotia), en route, in ballast, from Halifax to Louisbourg. The vessel hit 100 yards off shore - was pounded by heavy seas & ice. Assistance was not possible due to the vessel & island being surrounded by 1/2 mile of ice. The vessel was lost & the crew (about 30) were all lost also. Two earlier links to data, one re the detail of the 1920 loss referenced to Robert Parsons, seem to have vanished. I should try to save a screen shot of everything perhaps, in case the source dies? Anything to add? A cargo ship, probably a collier. Per 1 [Llanberis (1) states, however, that vessel was built by Ropner at Stockton], 2 ('pdf', p.61 sinking ref. ), 3 & 4 (U-57), 5 ('wrecksite.eu', wreck, Georgios Markettos), 6 (Miramar, link, you now must be registered to access). 290.0 ft. long (88.39 metres), signal letters LQDB. Built for Llanberis Steamship Company, Ltd., of Cardiff, ('Evan Thomas, Radcliffe and Co.' the owners/managers?). In 1910 the vessel was renamed Badminton. It was sold, in 1912, to Coroniadis Bros., of Syra or Syros, Greece, & renamed Coroniadis. And sold in 1915 to Frangopoulos Bros., also of Syra, & renamed Maleas. And sold again, in 1917, to C. P. Markettos, of Piraeus, Greece, & renamed Georgios Markettos. On Oct. 12, 1917, while en route from Newport, Wales, to Oran, Algeria, with a cargo of coal, the vessel was sunk by a torpedo fired by U-57, Kapit�nleutnant Carl-Siegfried Ritter von Georg in command, in the Bristol Channel, 4 miles off St. Govan's light vessel, Pembrokeshire. There was, apparently, no loss of life. U-57, from Sep. 1916 to Dec. 1917 during WW1, sank 57 ships & damaged 5 more. WWW data is quite limited. Do you have anything to add? An image? A cargo ship. Per 1 ('plimsollshipdata.org', Lloyds Register data, Ossian, 1930/31 thru 1940/41), 2 ('wrecksite.eu', sinking of Ossian), 3 (Miramar, link, you now must be registered to access). 260.0 ft. long (79.25 metres) perpendicular to perpendicular, speed of 8 knots, signal letters JSBT later SPXK. The vessel was built for 'Eredi C. Cav. Gerolimich', of Lussinpiccolo, a town on the island of Lo�inj, western Croatia, in the Adriatic, but then belonging to the Austro Hungarian Empire. It was sold, in 1901, to 'H. A. Petersen' & renamed Brunsnis. And sold again, in 1910, to 'O. H. Wiens', owners of 'AB Kronan', of Malm�, Sweden, & renamed Harald. And sold in 1918 to 'G. Carlsson' & renamed Valpen. In 1919, the vessel was sold again, to 'Rederi-A/B Alfa', O. B�rjesson the manager, of Helsingborg, Sweden, & renamed Ossian. On May 15, 1941, the vessel was torpedoed & sunk by British aircraft off the coast of Germany. At 54.00N/7.16.05E. 3 lives were lost, 2 in the attack & one later. Henk de Boer advises (thanks!) that in or about 1940 or 1941, a vessel named Ossian, perhaps this ship, was stuck in the ice at Ijsselmeer, the Netherlands. Folks from Volendam walked out over the ice to take bread & other supplies to the ice-bound ship. You used to be able to see a short video of the walk here - but no longer, it would seem since the link no longer works. There are many gaps in the above data. Now you would think that there would be lots of WWW references to such a long-lived ship. But finding any data at all re this vessel proved to be most difficult. Can you add anything? A cargo ship. Per 1 (text & image, source of my data - there was also an expired eBay listing, with the same image which, per vendor appeared 'to be a painting at a U.S. port. '), 2 (reference, Thyra), 3 (Thyra data at #37, a 'doc' file), 4 ('wrecksite.eu', 1914 wreck, image), 5 (Miramar, link, you now must be registered to access). 339.0 ft. long (103.33 metres) perpendicular to perpendicular, speed of 10 knots, signal letters HMND. Built for 'A/S D/S Thyra's Rederi' (Wilh. Wilhelmsen), of T�nsberg, Norway, at the cost of 656,012.26 kr., initially for their Africa/Australia/New Zealand service. On Jun. 11, 1914, the vessel was wrecked at Duncansby Head, near John O' Groats, at the NE tip of mainland Scotland, while en route from the Tyne & Dundee to New York with general cargo. Mette Francke has been in touch (thanks!) to advise that his great grandfather was one of the captains of Thyra. When off the coast of India in 1910, his wife Karoline gave birth to a daughter, a sister to Mette's grandmother - the baby being named Thyra Emmelyn Inda. Can you add anything? A cargo ship launched in Nov. 1906. Per 1 (comprehensive Lloyd's Register 1918/19 text), 2 (ref. Marlwood, 08/01/2006 & 10/02/2006), 3 ('convoyweb.org', WW2 convoy duty, click on 'SHIP SEARCH' then insert Marlwood), 4 (Lloyds Register data, Marlwood, 'plimsollshipdata.org', 1930/31 thru 1933/34), 5 (Miramar, link, you now must be registered to access). Single screw, 279.3 ft. long (85.13 metres) perpendicular to perpendicular, speed of 10 knots, signal letters HJRM, schooner rig, 194 HP. Built for William France, Fenwick & Co., of London. In 1917, the vessel was sold to European Gas Co. Ltd., also of London, with H. A. Brightman & Co., the managers. In 1926 it was sold again, to Harries Bros. of Swansea. The vessel arrived at Briton Ferry, S. Wales, in Jul. 1933 to be broken up at the ship-breaking facilities there of T. W. Ward. I have no data at all about its service history, particularly during WW1. Anything to add? An image perhaps? Donald McLean has kindly been in touch. To advise that his father, William Arthur McLean, served as wireless operator aboard Marlwood from Aug. 1921 until he joined Jolly Inez in 1922. And to provide the Marlwood image which is now available at left. A cargo ship. Per 1 ('Tuesday, 9 January', Oakgrove), 2 ('convoyweb.org', WW2 convoy duty, click on 'SHIP SEARCH' then insert Oakgrove), 3 (Lloyds Register data, 'plimsollshipdata.org', Oakgrove, 1930/31 thru 1938/39), 4 ('wrecksite.eu', wreck data, Oakgrove), 5 (Miramar, link, you now must be registered to access). 279.5 ft. (85.2 metres) long, speed of 8 1/2, 9 1/2, or 10 knots (data differs), signal letters HFGQ later GBJM. Built for Needwood Steamship Co. Ltd. (William France, Fenwick & Co., of London, noted for the carriage of coal to London, probably the owners). Of interest perhaps, William France, Fenwick & Co. owned another vessel of the identical name, also built of Osbourne, Graham & Co., but in 1904. That earlier Needwood was sold by them in 1905 to Union Steam Ship Company of New Zealand Ltd., of London & Dunedin, New Zealand. In 1925, the vessel was sold to 'Grove Line (Glasgow) Ltd.' (David Alexander & Sons, the managers) & renamed Oakgrove. And registered at Glasgow. Only one WW2 convoy ref. Convoy FN.10 from Southend, Essex, to Methil, Fife, Scotland, in Sep. 1939. On Jan. 9, 1940, while proceeding independently from Santander, Cantabria, Spain, to Grangemouth, Firth of Forth, Scotland, with a cargo of iron ore & a crew of 21 all told, Oakgrove was bombed by German bombers of the 'FliegerKorps X' & sunk. 7 miles NWxW of the North Lemon Buoy, at Cromer, Essex. One life was lost - W. D. Falconer, the ship's Captain. I read that the ship's bell, with a date of 1905 recorded upon it (image at left), was recovered from the wreck by Dave Hamlyn of the 'Hull BSAC 14' (British Sub Aqua Club) during a dive on MV Maise Graham. Anything to add? A cargo ship, a collier, launched on Sep. 10, 1907. Per 1 [Union Steam Ship, Kaitangata (1)], 2 ('wrecksite.eu', sinking, Kaitangata), 3 (1908 New Zealand ref. to vessel at column bottom), 4 (Kaitangata sinking, 2 articles, dated Oct. 26 (L) & Nov. 29, 1937 (R) ex 'The Argus', Melbourne, available here & here), 5 (explosion & loss details), 6 (Lloyds Register data, 'plimsollshipdata.org', Kaitangata, 1930/31 thru 1937/38), 7 (Miramar, link, you now must be registered to access). 279.5 ft. long (85.19 metres) perpendicular to perpendicular, speed of 9 or 10 knots, signal letters HLQF later VPBW, 198 HP. Was christened by Mrs. H. L. Pattinson. Built, at a cost of �24,000, for William France, Fenwick & Co., of London, noted for the carriage of coal from the north east to London & other ports in the south of England. It is possible that the vessel was registered in the name of an owned company, as was so for Needwood, above. In 1908, the vessel was sold, for about �26,000, to 'Union Steam Ship Company of New Zealand Ltd.' ('Union'), of London & Dunedin, New Zealand ('NZ'), & renamed Kaitangata. Was registered at Dunedin. Kaitangata? A town near the coast at South Otago, South Island, NZ, noted for its coal mines which operated from the 1870s thru to 1972. After acquisition by Union, the vessel was fitted with powerful winches, & other improvements were effected. And then, with Captain Ransom in command, the ship carried cargo from Glasgow & Liverpool, to Fremantle, Western Australia. And onwards to Bunbury, to load jarrah (timber) for NZ. The vessel visited Auckland, NZ, as Kaitangata, 12 times between Jul. 10, 1925 & Dec. 11, 1929 - but that is not unusual since she was, of course, NZ owned. In 1930, the vessel was sold to 'Ling Nam Steamship Co. Ltd.', of Hong Kong, owned maybe & certainly managed by S. T. Williamson & Co., with no change of vessel name. But U.K. registered. In late Oct. 1937, the vessel, under the command of Captain H. MacPhee, was en route from Hong Kong, to Hainan Island, southern China, & Haiphong, Vietnam, with a cargo of gasoline & oil, 26,000 & 995 cases respectively. Early on Oct. 25, 1937, a terrific explosion occurred in No. 2 hold, which blew many of the ship's hatches & blew crew members overboard. It also precipitated a massive fire. The crew, & maybe passengers also, dived into the sea to escape the inferno. Nanning arrived on the scene & began the work of survivor rescue. HMS Thracian came at full speed from Hong Kong (about 150 miles distant) in response to an SOS message, & found the vessel engulfed in flames from stem to stern. Thracian took 18 crew on board, including the Captain, while 26 others were missing. Those numbers seem to have been preliminary since the later newspaper article linked above refers to 19 having lost their lives. The vessel may have been carrying some passengers. When Thracian left to return to Hong Kong, the vessel was engulfed in flames. En route, Thracian was instructed to return to the scene & sink Kaitangata, lest she be a danger to navigation. But, by the time she got there, the vessel had sunk. The above all happened at 21.40N/112.00E, close to the China coast in the China Sea. Do you have anything to add? Or to correct? A cargo ship. Per 1 ('Furness Withy', Thimbleby), 2 [H. Hogarth, Baron Kelvin (2)], 3 (Lloyds Register data, 'plimsollshipdata.org', Takasago Maru, 1930/31 & 1931/32), 4 ('wrecksite.eu', re Takasago Maru wreck), 5 (Miramar, link, you now must be registered to access). 279.0 ft. long (85.04 metres) perpendicular to perpendicular, speed of 9 1/2 knots, signal letters SPQD. Built for Furness, Withy & Co. Ltd., of West Hartlepool. In 1915, the vessel was sold to Hogarth Shipping Co. Ltd. (Hugh Hogarth & Sons the managers) (Baron Line), of Glasgow, & renamed Baron Kelvin, but the ship was registered at Ardrossan, Ayrshire, Scotland. The owners of the Baron Line had, at one time I read, a reputation for being 'economical' when feeding their crews, and, as a result, the line was nicknamed the 'Hungry Hogarths'. In 1923, the vessel was sold again, to British Invicta Shipping Co., of London, 'Eggar Forrester P' the manager?, & renamed L'Invicta. In 1923, the vessel was sold to T. Murao, of Tarumi, Japan, & renamed Takasago Maru. It would appear that it was sold twice more. The 1930/31 Lloyd's Register lists 'Asahi Shokai KK', of Takasago, Japan, as the ship's owner - while the 1931/32 edition states 'Sanbo Kisen Goshi Kaisha', also of Takasago, to be the then owner & notes that the vessel was wrecked in Mar. 1932. Miramar advises that the vessel was wrecked on Mar. 6, 1932, when en route from Miike, Hukuoka, Japan, to Kunsan, South Korea, with fertilizer. I have previously stated here that the vessel ran aground & was lost, in fog, off Kodori Ho, near Mokpo, South Korea, on that date. Was there any loss of life? Can anybody tell us about the circumstances? Or otherwise add anything? A cargo ship. Per 1 ('Furness Withy', Westhampton), 2 (H. Hogarth, Baron Cathcart), 3 (data, Baron Cathcart), 4, 5 & 6 (wreck references, Marjorie Seed), 7 & 8 (Baillie references), 9 ('wrecksite.eu', sinking, Majorie Seed, image), 10 (Miramar, link, you now must be registered to access). 279.3 ft. long (85.13 metres) perpendicular to perpendicular, speed of 10 knots, code letters HKBF, later HRTJ. Built for 'British Maritime Trust Ltd.', of West Hartlepool, which company would seem, in 1907, to have been amalgamated with Furness, Withy & Co. Ltd. ('Furness'), of West Hartlepool. Registry, into the name of Furness, was in 1908. In 1909, Furness chartered the vessel to 'Anglo-Hellenic Steamship Company Limited', of Andros, Greece, 'Embiricos' the managers?, & for the duration of the charter the vessel was renamed Elli. It reverted to Westhampton at charter end. The Westhampton's brass ship's bell would seem to be in the Scottish Maritime Museum. In 1913, the vessel was sold to 'J. (John?) Gaff & Co.', of Glasgow, & renamed Amphion, but in 1915, with no change of vessel name, the vessel was acquired by Hogarth Shipping Co. Ltd., via Kelvin Shipping Co. Ltd., of Ardrossan, Ayrshire, Scotland, (Hugh Hogarth & Sons the managers?) (i.e. 'Baron Line'), of Glasgow. In 1917, the vessel was renamed Baron Cathcart. The ship was likely registered at Ardrossan. The owners of Baron Line had, at one time I read, a reputation for being 'economical' when feeding their crews, and, as a result, the line was nicknamed the 'Hungry Hogarths'. In 1924, the vessel was sold again, but the WWW available data from this point becomes confusing. It was sold to Seed Shipping Co. Ltd. ('Seed'), of Newcastle, & renamed either Marjorie Seed or Majorie Seed. Miramar & 'Charles Hocking' both advise us that on Dec. 25, 1924, i.e. Christmas Day, Marjorie Seed was wrecked on Lady Isle, en route from Glasgow to Huelva (Andalusia, Spain), with a cargo of coal & coke. But many sites state that the vessel rather left on Boxing Day, & that the ship was then wrecked on Dec. 26, 1914. I choose to believe that the courts would have had the facts accurately & in that regard there are two legal references. In the first 'Rio Tinto Company' sued Seed for the loss of the cargo, including in their arguments the incompetence of the master & 'unnecessary deviation' of route. In a 2nd case, Lavabre v Wilson, the stranding was again referenced. The courts clearly understood that the wreck was on Dec. 25, 1924. As did Lloyd's. And all refer to the vessel's name being Marjorie Seed. So what happened? The ship left Rothesay Dock, Glasgow, at about 11:30 a.m. on Dec. 24, 1924. The name of her captain? It went off course, for reasons unknown, in fair weather, & at about 5:30 p.m. it ran aground on rocks on the NE tip of Lady Isle, a small uninhabited island in Ayr Bay, off Troon. Distress calls at about 6 p.m. brought a lifeboat & a tug (Starlight?) to the scene & they rescued 20 of the 24 man crew. By then, it would appear, all of the vessel's hatches were submerged. It seems likely that the other 4 crew members safely made it to safety by other means. The vessel was apparently badly holed 'in her post side' (does that mean 'port' side?). It was hoped that the vessel could be re-floated, however, in the week following the grounding, the vessel was battered by a south-westerly gale & when inspected in Feb. 1925 she was determined to be a total constructive loss. Alexander Baillie, of Troon, purchased the wreck & with David Gush broke the vessel up & shipped the scrap across to Troon on the Halfton, (later named Hafton). Very little of the wreck remains today. What little there is is apparently spread over a wide area at 55.32.09N/04.43.27W, in about 10 metres of water. A number of slightly different locations are WWW mentioned. Was there an official enquiry into the grounding? Can you add to and/or correct the above? Another image? A cargo ship. Per 1 ('Furness Withy', Grantley), 2 (data & image, Grantley, low on page), 3 (Swedish Wikipedia page, Diana), 4 (link 3 translated), 5 ('plimsollshipdata.org', Lloyd's Register data, 1930/31 thru 1944/45). 6 (Miramar, link, you now must be registered to access). 279.1 ft. long (85.07 metres) perpendicular to perpendicular, 289.1 ft. long overall?, speed of 9 1/2 (or 8) knots, signal letters LFNV, later HMDS, LCET, OHWK & SEQA, 175 HP. Built for Furness, Withy & Co. Ltd. ('Furness'), of West Hartlepool. In 1921, the vessel was sold to A. Capel & Co. Ltd. ('Capel'), of West Hartlepool. Most WWW references to Capel, maybe Arthur Capel & Co. Ltd., are to Cardiff, however. Could it have been a company related to Furness? Especially since 1 does not mention Capel. Can anybody clarify? In 1922 or 1923, the vessel was sold to 'H. Harrison (Shipping) Limited', of London (have seen references to West Hartlepool & Liverpool also), & renamed Kennington. In 1924, the vessel was sold to 'D/S A/S Saima', D. Martens-Nielsen the manager (have also seen a reference to E. Hammer being the manager), of Bergen, Norway, & renamed Blenda. In 1934, the vessel was sold again, to 'Rederi A/B Diana' ('Diana'), of Br�nd�, Helsinki, Finland, Sigund Nybonde the manager, & renamed Diana. 'Tore Ulff A/B' ('Ulff'), of Stockholm, Sweden, became the manager in 1941 & Gunner Eriksson by 1941/42 & back to Ulff in 1942/43. On Aug. 5, 1942, when in a German convoy, & en route from Gothenburg to Delfzilj, the Netherlands, with a cargo of 'silkesmassa', a Swedish word I cannot WWW translate, a mine exploded under the vessel's stern. Three crewmen were injured. Can anybody tell us about damage to the ship? On Mar. 5, 1944, the vessel was en route from Emden, Germany to Havringe, Sweden, with a cargo of coke, when it was aerial torpedo bombed & sunk, by RAF aircraft, N. of Borkum, Germany. Two crewmen were killed, probably in the explosion. The rest of the crew took to ship's rafts & were rescued by a German convoy. Can anybody tell us more about the circumstances? Or otherwise add anything to this listing? A cargo ship. Per 1 (Stanhope Steamship, Stanwold), 2 ('convoyweb.org', WW2 convoy duty, click on 'SHIP SEARCH' then insert Stanwold), 3 (data), 4 (data, including Stanwold crew list, on 3 pages), 5 ('plimsollshipdata.org', Lloyd's Register data, Pervyse, 1930/31 thru 1940/41), 6 (Miramar, link, you now must be registered to access). From 1930/31 210.5 ft. long (64.16 metres) perpendicular to perpendicular, speed of 10 knots, signal letters MBCT, later MPSV. Built for Cie. Belge-Scandinave de Nav. � Vap. (Soc. Anon. ), of Belgium. In 1916, the vessel was sold to 'Messageries Maritimes Belges', of Antwerp, & renamed Pervyse. The vessel was modified & the gross tonnage became 1019. In 1930, the vessel was sold to Atkinson & Prickett Ltd., of Hull, & renamed Easingwold. And in 1937, the vessel was sold again, to 'Stanhope Steamship Co. Ltd.', J. A. Billmeir & Co. the owners/managers, & renamed Stanwold. On Sep. 8, 1937, the vessel was captured by forces of General Franco, off Gijon (N. coast of Spain). The vessel was detained at Ferrol (NW Spain) & was released on Nov. 1, 1937 absent her cargo which had been confiscated. On Jun. 22, 1938 the vessel was interrogated by an armed 'Franco' rebel trawler, 8 miles SW of Europa Point (southernmost point in Gibraltar). One blank was fired at the ship, which was not hit & safely made Gibraltar. On Nov. 26, 1938, the vessel suffered superstructure damage in bombing at Valencia, Spain. 18 WW2 convoy references, all U.K. coastal. On Sep. 15, 1940, the vessel was damaged by German aerial bombing when at Southampton. I would like to be able to tell you what eventually happened to this vessel but the story is most confused. While what follows is my best understanding of the events, corrections are invited. It would seem that Stanwold left the Tyne on Feb. 23, 1941, James McCreadie in command, with 22 aboard all told including two gunners, with a cargo of coal, destined for the Isle of Wight (i.e. Portsmouth/Cowes). It safely made Southend & left there on Sep. 26, 1941 for the final leg of her journey. It would seem that the vessel was in convoy, but if it was that convoy seems not to be listed at 2. It is possible that the voyage is reported there as an 'independent' voyage, but the site denied me access to all 'independent' data. At 11:30 p.m. on Feb. 26, 1941, the vessel reported steering problems. At 4:20 a.m., on Feb. 27, 1941, the vessel was sighted, (by whom?) listing (heavily perhaps) to starboard. Even though Stanwold was wireless equipped, no further word was heard from the vessel which sank, on Feb. 27, 1941, at 50.38.00N/00.20.02W (I think) approx. 7 miles SE of Beachy Head, Sussex, or 19 miles WSW of Selsey Bill. All 22 lives were lost, though Chief Officer John D. (Dalton) Potts 'survived the sinking but died on shore from hypothermia'. Bodies were washed up, some days later, at Pevensey. I have not read the weather conditions at the time. Nor have I read why no vessel went to her assistance, nor how so many lives could have been lost so very close to the coast. The wreck is substantially intact, lying 3/4 upside down, at 50.38.10N/00.20.02W. It would seem that the vessel's ship's bell was long since recovered. What had happened? Most sites say that the cause of the loss is unknown, others say that the cargo of coal had shifted. Another site says that it hit a mine. Some sites say the vessel was travelling eastbound rather than westbound at the time. A strange story indeed. Anything to add? An image? A cargo ship. Per 1 (Furness, Withy, Harlingen), 2 (extensive data in Swedish), 3 (link 2 translated), 4 ('convoyweb.org', WW2 convoy duty, click on 'SHIP SEARCH' then insert Feddy), 5 ('wrecksite.eu', Feddy sinking, image), 6 & 7 ('plimsollshipdata.org', Lloyd's Register data, Feddy, 1930/31 thru 1943/44 & 1944/45), 8 (Miramar, link, you now must be registered to access). 210.0 ft. long (64.01 metres) perpendicular to perpendicular, signal letters HQDJ, later NGQL OYCL & MPLL, 106 HP. The vessel was built for Furness, Withy & Co. Ltd. ('Furness'), of West Hartlepool. In 1911, the vessel was sold to Friedrich Schulz ('Schulz') of Memel, East Prussia, Germany, now Lithuania, with no change of vessel name. I must wonder whether that truly was a sale. Maybe instead Schultz chartered the vessel & it later reverted to effective Furness ownership? In 1912 the vessel was transferred to G. V. Turnbull & Co. Ltd. of Leith, Scotland, a subsidiary company of Furness, & renamed Peter Pan. In 1916, ownership would appear to have reverted to Furness with no change of vessel name. In 1922 or 1923, the vessel was sold to 'Rederi A/B Sirius', of Helsingborg, Sweden, E. R. Killman the manager, & renamed Sirius. In 1923, the vessel was sold to 'Ensign Shipping Co. Ltd.', of Newport, Wales, G. J. Dunn the manager, & renamed Newburn. In 1927, 'D/S A/S Als', of Copenhagen, Denmark, acquired the vessel, Aage M. Vollmond & N. Winther the managers (in 1931 just Aage Vollmond), & renamed it Feddy. On Apl. 9, 1940, the vessel, lying at Grangemouth, Scotland, was requisitioned by the 'Ministry of War Transport' for WW2 service - managed by Wm. Cory & Son Ltd., with no change of name. Just 15 WW2 convoy references, all U.K. coastal. On Apl. 5, 1942, while en route, independent & in ballast, from Thorshavn, in the Faroe Islands, to Methil, Firth of Forth, Scotland, the vessel was in collision with HMT Visenda, FY138, an armed trawler, off North Ronaldsay, Orkney Islands. Feddy would seem to have been sunk - any loss of life on either vessel? Visenda, an ASW (anti-submarine warfare) trawler, had the distinction of being the first ASW trawler to sink a German submarine - U-551 on Mar. 23, 1941, with depth charges. There were no U-551 survivors. Major medals (1 DSO, 1 DSC, 2 DSM's) were awarded to its crew for that success. Visenda survived the war & was returned to her owners in Feb. 1946. The Feddy wreck has not been located. There are, it would appear, images in existence of the vessel as Sirius & as Feddy. But I am not able to find a link to them. The above may well need corrections, which are invited. Can you otherwise add to the story? An 'archdeck' collier, that had a very long life indeed. Per A (e-Bay image, Camden), 1 ('convoyweb.org', WW2 convoy duty, click on 'SHIP SEARCH' then insert Juliette), 2 (extensive data & drawings, as per 'The Marine Engineer..' below), 3 (comprehensive vessel's history, ex 'In the Wake of the Uljas', published in 2006 by the John Nurminen Foundation), 4 (Lloyd's Register data, 'plimsollshipdata.org', Camden, 1930/31 thru 1938/39), 5 ('plimsollshipdata.org', Lloyd's Register data, Juliette/Liisa, 1938/39 thru 1945/46), 6 (Miramar, link, you now must be registered to access). 240.2 ft. long (73.21 metres) perpendicular to perpendicular, 250.2 ft. long (76.26 metres) overall, speed of 9 1/2 (or 8 1/2) knots, call letters MFRJ, later JHMS & OFDT. Built on the 'Ayre-Ballard arch principle' to effect lower steel usage & a lesser hull weight, in fact the first such ship. With absolutely clear holds. Due to stormy weather, the vessel was unable to run the measured mile at its trials. Built for 'Rederi A/B Edenor'/'Rederiaktiebolaget Edenor', of Helsingborg, Sweden, 'Tuve Persson' the managers, ('Gronquist, Bryan & Co.', of Newcastle, would seem to have ordered the vessel). Her construction was delayed by industrial action (boilermakers). 'Engineering Magazine' published in 1911 & 'The Engineering Index', published in 1912 (both in the U.S.), contain illustrated descriptions of the vessel's design, & 'Where Ships Are Born' refers to the vessel. 'The Marine Engineer...', in Jun. & Jul. 1911, however, featured many pages re the vessel which are available here (search for 'Edenor') - at pages 402/5 & 457/60 (also 346/7 & 391). Its maiden run was with coal to Calmar, Sweden. The vessel would seem to have spent most of its life in the Baltic. On Dec. 23, 1914, the vessel was sold to 'Gardner Lockett & Hinton Limited' ('Gardner') of London, (colliery agents, coal contractors & ship owners), & renamed Camden. Gardner, in 1929, was reorganised to become 'Charrington, Gardner, Lockett & Co. Ltd.' ('Charrington'), also of London. In 1930, the vessel was transferred to Charrington Steamship Co. Ltd. of London, with Charrington the managers. In 1938, the vessel was sold to 'Angel & Son Co. Ltd.', of London, Claude Angel the manager, with no change of vessel name. On Apl. 13, 1939, the vessel was sold to 'Laiva O/Y Fennia Steamship Co. Ltd. ('Laiva') of Helsinki, (Helsingfors), Finland, & renamed Juliette, 'John Nurminen O/Y', of Helsinki, the managers. Laiva was almost entirely owned (997/1000) by F. W. Moorsom & Co. Ltd., of Cardiff, who chartered the vessel for service from the U.K. to the Iberian peninsula. Indeed the vessel was named 'Juliette' after the daughter of the principal of Moorsom. Just 2 WW2 convoy ref. re Juliette & none re Liisa. The vessel was requisitioned, in Jan. 1940, by the Finnish Government, ordered to proceed from Port de Bouc, France, to Bizerta, French North Africa, & there loaded 4 12 inch guns ex General Alexeyev for use in the Winter War against the Soviet Union. She made it to Newcastle & there was rammed by Warlaby, necessitating 3 weeks of repairs. The vessel eventually discharged its cargo at Turku, Finland, on Sep. 8, 1940. On Sep. 3, 1940, the vessel had been renamed Liisa. Was then engaged on the Baltic/North Sea trade. On Jan. 3, 1941, the vessel sank at Bremen, Germany, when hit in an Allied air attack. She was re-floated in mid April, towed to Helsinki, & was repaired (took a whole year). The vessel was then time chartered to the German Government for trading on the Norwegian coast & North Sea thru 1944. And was chartered again to carry reparation goods to the Soviet Union thru Sep. 1945. On Oct. 21, 1947 the vessel was renamed Marja-Liisa Nurminen. In 1948, Laiva amalgamated with 'John Nurminen Oy', of Helsinki. In 1949, the vessel was sold to 'Laivanis�nnist�yhti� Arkadia', of Helsinki, & renamed Arkadia. In 1951, the vessel was transferred to 'Etel�-Suomen Laiva Oy', of Helsinki, 'Polttoaine Osuuskunta i.L.' the managers. On Aug. 26, 1959 the vessel was sold to 'Sorema S.p.r.l. ', of Hemixem (nr. Hoboken), Belgium, & arrived there on Oct. 8, 1959 to be broken up. Very few WWW references to the vessel. But lots of data is available thanks to 'Matti Pietik�inen', Hannu Vartiainen of the Rauma Maritime Museum, & the 'Nurminen Foundation'. Do read the complete story via link 3 above. Anything you can add? A 'corrugated' ship, a collier. Per 1 (vessel launch, ex 'The Marine Engineer and Naval Architect', of Nov. 1911, a 'Google' book), 2 ('wrecksite.eu', wreck data, image, Maindy Hill), 3 (Hyltonia, corrugated design), 4 (Clara, 1917 rescue), 5 ('convoyweb.org', WW2 convoy duty, click on 'SHIP SEARCH' then insert Maindy Hill), 6 (ref. 'Saturday, March 9th 1940', Maindy Hill), 7 (St. Rosario, 6th item down), 8 (Maindy Shipping, 1922, 80% down re Maindy Lodge), 9 (Lloyd's Register data, 'plimsollshipdata.org', Maindy Hill, 1930/31 thru 1938/39), 10 (Miramar, link, you now must be registered to access). Single screw, 279.5 ft. long (85.19 metres) perpendicular to perpendicular, speed of 8 knots, signal letters HTNK later GLPQ. Built for 'The Ericsson Shipping Company Limited', of Newcastle. The vessel was requisitioned for service during WW1, but I have not read the dates. On Apl. 6, 1917, the vessel rescued, after they had spent 3 hours in lifeboats, the crew of Clara, a 924 ton barque, stopped & scuttled by UC-55, 28 miles N. of Founa, (where exactly is it? ), Shetland Isles. Clara was en route from Buenos Aires, Argentina, to Copenhagen, Denmark, with a cargo of wheat. Hyltonia landed Clara's crew at Lerwick, Shetland Islands. Suzanne McMann has kindly been in touch to advise that Harold H. (Henry) Duncan, Suzanne's great grandfather (?/1949), was Master of Hyltonia during WW1. And that in Jul. 1919 a book was presented to Captain Duncan 'for his retention as a memento of War Service'. The book was a copy of 'C.B. 415 War Instructions For British Merchant Ships', a secret (C.B. means Confidential Book) 100 page book issued by the Admiralty in Aug. 1917 that in both the original & in this presentation copy was lead weighted in its cover that it might be thrown overboard, sink & not end up in enemy hands. Thank you Suzanne for so advising us. In 1919 the vessel was sold to 'Maindy Shipping Company Ltd.' ('MaindyCo'), of Cardiff, & in 1920, was renamed Maindy Hill. I previously had instead referenced 'Jenkins Richards E' instead, which would seem to correctly be 'Jenkins, Richards & Evans Ltd.' ('Evans'), of Cardiff, Wales. Muriel Goodman advises (thanks!) that 'Jenkins' refers to Thomas Jenkins, her grandfather, who owned MaindyCo. (There was also a company named 'E. Jenkins & Company', also of Cardiff.) I would presume that Evans were therefore the managers for MaindyCo. The name of Maindy would seem to originate with the area so named in the city of Cardiff. MaindyCo would seem to have gone into liquidation in 1921 & in that year, per Miramar, the vessel was acquired by Sir David R. Llewellyn ('Llewellyn'), of Newcastle - with James Rattary of Cardiff likely the manager. Llewellyn had acquired ten MaindyCo steamers at auction, including Maindy Hill, for a total of �290,000. In 1925, the vessel was sold to 'Matthew Taylor', of Methil, Fifeshire. I read that the vessel was requisitioned for WW2 service by the Admiralty. Just 2 WW2 convoy references, both U.K. coastal, in Jan. & Feb. 1940. On Mar. 9, 1940, while headed south, with a cargo of coal from Methil bound for Bayonne, SW France, the vessel was in collision with St. Rosario, 4 1/2 miles off Heugh Lighthouse, Tees Bay, Hartlepool. The vessels were crossing courses. There was contact between the stem of St. Rosario & the port side of Maindy Hill, which sank as a result of the encounter. 23 Maindy Hill crew members, one of them injured, were landed the next day at Hartlepool Dock Head. Anything to add? Another image? A cargo ship completed Mar. 1911. Per 1 (in English) & 2 (in Portuguese), 3 (in Portuguese) & 4 (Google translated into English), 5 (Miramar, link, you now must be registered to access). 185.0 ft. long, 56.4 metres long perpendicular to perpendicular, 62 HP. I surely regret my inability with languages, in this case with Portuguese. Petrel was, it would seem, a small coastal steamer, built for 'Empreza de Nav. Sul Rio Grandense', of Rio Grande do Sul, the southernmost state in Brazil. And from 1915 from Rio de Janeiro, Brazil. It had a short life. It left 'Rio Grande do Sul' on May 29, 1915 bound for Rio de Janeiro, & was declared lost on Aug. 18, 1915. All 24 crew were lost. A 1915 date would seem to be confirmed by Lloyds Register. However the Brazilian Navy believes that the vessel was sunk on the south coast of Rio de Janeiro after a collision with a barque named Storning - but in 1916 rather than in 1915. It would seem, that a wreck known locally as Navio do Breu, (which means 'Ship of the Grease', because in the wreckage there are dozens of barrels of grease), may well be the wreck of Petrel. The vessel was, if I understand correctly, engaged in the shipment of salt from Rio to Rio Grande do Sul for 'Pachico Aguiar & Co'. But carried other cargo also. I need help, both with the facts & with the translation. Is what I have said essentially correct? An image? An 'arch deck' freighter. Per 1 (data, Honoreva), 2 (Maggie lawsuit), 3 (refs. Honoreva), 4 (ref. Honoreva at page bottom), 5 (Apl. 18, 1914 ice report), 6 (Miramar, link, you now must be registered to access). 220.5 ft. long (67.21 metres) perpendicular to perpendicular, 245.0 ft. long (74.68 metres) overall, of a size built to be able to operate in the St. Lawrence River, Canada, lock system of its time. Built - on the 'Ayre-Ballard arch principle' to effect lower steel usage & a lesser hull weight - for Donald Steamship Co. Ltd. of Bristol & New York (1, 2), but registered at Bristol. T. L. Evans was the managing owner. In 1914, the vessel was chartered to Ontario Transportation & Pulp Co. ('OTP'), of Montreal, to carry pulpwood (capacity 850 chords) to the paper mill at Thorold, Ontario, owned by OTP's parent company, Ontario Paper Co. Ltd. of Thorold. To supply newsprint for the Chicago Tribune newspaper. The vessel became registered at Montreal, Quebec, Canada, in 1916. On Aug. 17, 1916, OTP purchased the vessel & soon sold or transferred it to 'Great Lakes Transportation Co. Ltd.', of Montreal. Who sold her to 'Cie. Royale Asturienne de Mines', (an international company now based in Belgium, I believe) of Tonnay-Charente (western France, N. of Bordeaux). The vessel was registered in France & renamed Asturienne. I read that she was recorded as a war loss in Q3 of 1917, but have read no detail of the circumstances. In May 1916 a lawsuit was heard by the Supreme Court of Canada respecting a collision in which Honoreva was involved. At a date unknown to the webmaster, Honoreva collided with Maggie a barge under tow at the time by Jackman, a tug. In the Soulanges canal, when passing through the abutments of an open swing bridge. Maggie was damaged & sank as a result of the collision. Honoreva was held to be solely at fault. The long abandoned Soulanges canal bypassed the rapids between Lake Saint-Louis & Lake Saint-Francis, Quebec. The canal operated from 1899 to 1958 when its role was taken over by the Beauharnois Canal. Can you help any? Perhaps with another image. An 'arch deck' cargo ship. Per 1 & 2 (builder's half model, extensive text & image of model), 3 (Furness Withy, Pensacola), 4 ('Sunday, 27 April', near bottom, Danapris), 5 (data & image, Pensacola), 6 (data & image, Pensacola, a French page), 7 ('plimsollshipdata.org', Lloyd's Register data, Saima/Danapris, 1930/31 thru 1945/46), 8 (Miramar, link, you now must be registered to access). 279.2 ft. long (85.10 metres) perpendicular to perpendicular, speed of 9 (or 8 1/2) knots, signal letters LDQB later LCWR & SVIW. Built on the 'Ayre-Ballard arch principle' to effect lower steel usage & a lesser hull weight. Built for Furness Withy & Co. Ltd. for their U.S. service, registered at West Hartlepool. In 1921, the vessel was sold to Arthur Capel & Co. Ltd., also of West Hartlepool, but maybe of Newcastle. In 1923, the vessel was sold to 'H. Harrison Shipping Ltd.' of West Hartlepool & renamed Clapton. In 1925, the vessel was sold again, to D/S A/S Saima, of Bergen, Norway, & renamed Saima. Bergmann & Hammer ('Hammer') or Otto W. Bergmann, of Bergen, Norway, were likely the managers, however from 1930/31 D. Martens Nielsen were, per Lloyd's Registers, the vessel's managers. The vessel was sold again, in 1936, to Stefanos P. Synodinos, of Piraeus, Greece, Synodinos Bros. the managers, & renamed Danapris. On Apl. 27, 1941, when at Piraeus, the vessel was bombed by German aircraft & sunk. The story is confused however. I read i) that the steamer was repaired by the Germans for their own use & ii) that the vessel was refloated but was wrecked at Chalkis, Euboea, before repairs had been effected. Can you help any? Perhaps with another image? A cargo ship. Per 1 (Furness Withy, Wingate), 2 [Johnston Line, Vedamore (2)], 3 (data & image, Erland, in Norwegian & English), 4 (Lloyd's Register data, Erland/Neeme, 'plimsollshipdata.org', 1931/32 thru 1938/39), 5 (Miramar, link, you now must be registered to access). 279.3 ft. long (85.0 metres) perpendicular to perpendicular, speed of 10 knots, or maybe 8 1/2 knots only, signal letters WPNM later LGTR & LCIS. 5 says 'corrugated'. I have seen a data 'snippet' dating from 1925 (Transactions of the Royal Institution of Naval Architects, Vol. 67) that states that the vessel, designed by a Mr. Haver, was 'an enormously bad vessel'. Can anybody tell us about that & about 'corrugated sides'? But now see the Newton Ash listing & here re 'corrugated'. Built for Furness Withy & Company Ltd. ('Furness'), of Newcastle. In 1922, the vessel was transferred to Johnston Line Ltd., which line was 50% owned by Furness & renamed Vedamore. In 1926, the vessel was sold to D/S A/S Eikland, of Risor, Norway, with I. (Isak) M. Skaugen, of Oslo, Norway, the manager, & renamed Erland. In 1927, D/S A/S Eikland moved to Oslo, Norway. In 1939, the vessel was sold to 'M�gi, Arvad, Ferdinand Pajom�gi, Edouard Risna, & Juri Lauri', who seem to be known as 'F. Pajom�gi et al', of Tallinn, Estonia, & renamed Neeme. I have also read the name of Neme but that name seems to be incorrect. Can anybody tell us about service early in WW2? I read that on Mar. 22, 1940, while en route from Savannah, Georgia, U.S.A., to Tallinn, with a general cargo, the vessel was damaged by ice, abandoned & sank. Off Landsort Lighthouse. At 58.53.05N/18.52E, E. coast of Sweden, in the Baltic, in the approaches to Stockholm, Sweden. Have not read the circumstances. Can you help any? Perhaps another image. A cargo ship, a collier/coaster. Per 1 (Hudson Line), 2 ('pdf' file, Dunkirk ref., top of page #2), 3 ('convoyweb.org', WW2 convoy duty, click on 'SHIP SEARCH' then insert Dagenham), 4 (Lloyd's Register data, Dagenham, 'plimsollshipdata.org', 1930/31 thru 1945/46), 5 (Miramar, link, you now must be registered to access). 280.0 ft. long (85.34 metres) perpendicular to perpendicular, speed of 10 knots, signal letters KCNT later GCDQ. Laid down as War Ness, for the British Government, but delivered to J. (or John) Hudson & Co. Ltd. of London, as Dagenham. Registered at London. In 1921, the vessel was transferred to 'Hudson Steamship Co. Ltd.', which company was formed in 1920, with J. Hudson & Co. Ltd., the managers. There is a place called War Ness - a rocky headland in the Orkney Islands, the southern tip of the island of Eday. From 1905, Hudson would seem to have been a subsidiary of 'Samuel Williams and Sons Limited' ('Williams'), of London, tug & collier owners. Would have carried coal from the north east to the river Thames & presumably to Dagenham. 2 seems to indicate that the vessel was involved in the evacuation of the British army from Dunkirk from May 27 to Jun. 4, 1940. But not so, it would appear. On Nov. 15, 1940, while en route from Methil, Fife, Scotland, to London with a cargo of coal, the vessel was mined in the Thames Estuary, 2.5 cables ENE of the Mouse Light vessel, & was beached on Yantlet Flats. It was re-floated on Nov. 21, 1940 & beached on Grain Island, & on Nov. 27, 1940 was re-floated a second time & towed by two tugs to Dagenham - Williams tugs, I presume. 53 WW2 convoy references, mainly U.K. coastal but including service in Jun. thru Aug. 1944 to Seine Bay, France, re the Normandy landings, & in 1945 to Antwerp, Belgium. The vessel was at Antwerp for six weeks in early 1945, being repaired. A modest incident at Antwerp - on one occasion, a bomb fell in the next dock. A seaman was emerging from a bathroom rigged upon the deck of Dagenham & the blast blew soot out of the funnel & covered him. He had to start his bath all over again! It would seem that the vessel's captain in Jun. 1944, (his name?) insisted upon being involved in the Normandy landings but collapsed & died from exhaustion a few days later. During WW2, the vessel carried a cargo of ships' biscuits to Normandy to feed the starving inhabitants. It turned out they had plenty of food (dairy products, meat etc.) & didn't want ships' biscuits. The vessel tried to discharge their cargo at several French coast ports, but were always turned away - no one wanted ships' biscuits! They finally took the cargo back to Dagenham. In 1956, the vessel was sold, for �52,000, to 'Minos Cia Maritima S.A.', of Panama, D. C. Kapotas, the manager, & renamed Nikitas K. On Nov. 29, 1957, the vessel, en route from Stratoni, Greece, to Brăila, river Danube, Romania, with a cargo of pyrites, sank in a gale in the Black Sea, with the loss of the Captain & 5 crew members. Have not been able to read the circumstances or the location, except for a reference to northern Turkey - presumably it sank then in the SW Black Sea off the Turkish coast. We thank Peter Buckwell for a significant portion of the above data - Peter's father, Arthur C. E. Buckwell (1914/ ), served, he advises me, as radio officer aboard the ship from Sep. 1943 to Feb. 1945. Some of Arthur's WW2 recollections are here. Can you add anything? An image? A cargo ship, especially designed for the timber trade. Per 1 (most extensive data & image, WW2 service incl. independent voyages, Tautra), 2 (1936 grounding, St. Joseph), 3 ('convoyweb.org', WW2 convoy duty, click on 'SHIP SEARCH' then insert Tautra), 4 (fine image, S. B. Lund, at Blyth, Northumberland in 1929), 5 (Lloyd's Register data, St. Joseph, 'plimsollshipdata.org', 1930/31 thru 1935/36), 6 (Lloyd's Register data, Tautra, 'plimsollshipdata.org', 1937/38 thru 1945/56), 7 (Miramar, link, you now must be registered to access). 258.0 ft. long (78.64 metres) perpendicular to perpendicular, speed of 10 1/2 (or maybe only 9) knots, signal letters MVRQ later LCYW. Built for 'D/S A/S Kriton', of Bergen, Norway, 'Jens Lund & Co. A/S', the managers. Registered at T�nsberg, Norway. In Feb. 1928, the vessel was sold to 'D/S A/S St. Joseph', of T�nsberg, no change of manager, & renamed St. Joseph. In 1936, the manager changed to Leif Gjesdahl, of T�nsberg. In Apl. 1936, the vessel was sold to 'T�nsberg Industri & Sj�farts-Bank A/S', of T�nsberg, 'Rafen & Loennechen' the manager. Such ownership change seems not to have been recorded in Lloyd's Register. Have not read about her service in the early years. Likely Baltic & the North Sea. In Oct. 1936, St. Joseph was en route from T�nsberg to Manchester with a cargo of iron ore. In gale conditions, the vessel ran aground on Oct. 14, 1936 on rocks at Grey Island in the Sound of Mull. At 56.28.4N/5.36.3W. Distress rockets were fired & an SOS was broadcast. She was attended by a Granton trawler which could offer no assistance in the terrible weather conditions - & when the trawler left the scene by Northern Coast, a Coast Line steamer. Also attending was the Barra lifeboat which came 70 miles to assist. 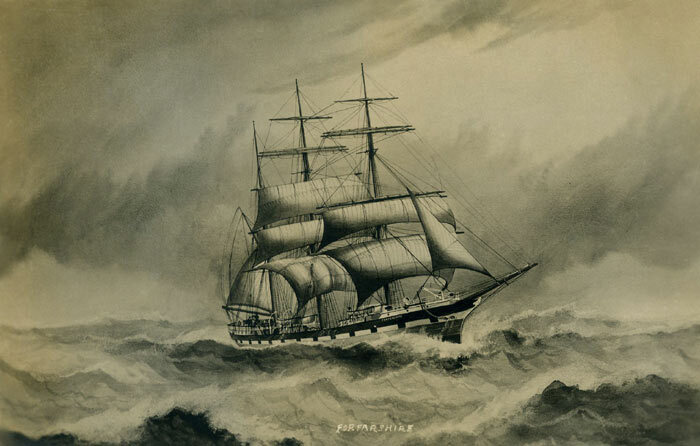 While the St. Joseph crew did not wish to abandon the ship, eventually Northern Coast did take off 17 crew members & safely landed them at Tobermory - Captain Anderson & three crew members stayed aboard the ship. The Barra lifeboat later rescued the Captain & the three crew members of St. Joseph & landed them at nearby Oban. It was considered unlikely that the ship could survive its battering on the rocks. However it did indeed survive. The cargo was jettisoned & likely a week or so into Nov. 1936 it must have been towed off (by whom & to where?) to presumably effect repairs. In Apl. 1937, the vessel was sold to 'Skibs. A/S Tautra', of Trondheim, Norway, 'Karl Torkildsen', also of Trondheim, the manager, & renamed Tautra. Then in North Sea service. 150 WW2 convoy references, principally U.K. coastal, but including at least 2 N. Atlantic crossings (carrying lumber & pit props), Mediterranean service, mainly from late 1944, (to such ports as Bari, Malta, Alexandria, Port Said, Augusta), to Norwegian waters in 1940, a single trip to Reykjavik, Iceland. The vessel was returned to her owners on Oct. 1, 1945 & resumed North Sea service. In Apl. 1956, the vessel was sold to 'Societa Rosamaris di Navigazione', of Messina, Sicily, 'Francesco Longobardo' the manager, & renamed Rosasicula. 1595 gross tons in Lloyd's Register of 1957/58. Registered at Palermo, Sicily, in 1961. On Jul. 7, 1962, while en route from Ravenna, Italy, to Alexandria, Egypt, with a cargo of fertiliser, the vessel ran aground on rocks near Ras el-Tin, outside Alexandria Harbour, Egypt. While I have not read the circumstances, I read that holds Nos. 1 and 2 & the engine-room were flooded. The vessel broke in 2 on Dec. 22, 1962, & was broken up nearby. Can you add to and/or correct the above? A cargo ship, a 'self-trimming' collier/coaster. Per 1 ('wrecksite.eu', Gap wreck data), 2 (data & image, Gap, in French), 3 (link 2 translated), 4 (Miramar, link, you now must be registered to access). 281 ft. (about 90 metres) long. Laid down as War Taff, for the British Government, but delivered to 'Societe Nationale d'Affretements', of Rouen, or Le Havre, or possibly Paris, France, as Gap & registered in France. At about 9 p.m. on Feb. 24, 1928, the vessel, en route in ballast from Rouen, France, to Barry, Wales, ran aground in a severe SE gale at Lowland Point, near Manacle Rocks, Falmouth, Cornwall. The Coverack lifeboat responded to her SOS call, & landed 15 crewmen - the officers, however, chose to stay aboard the ship. Tugs also came to her assistance but were unable to help in the gale conditions. I have read that the wreck site is also referred to as 'Coverack', the name of a nearby fishing village. The vessel was holed by the rocks & became a total loss. It was sold in situ. 1 notes that 8 months later, in yet another storm, the Coverack lifeboat was again at the scene, rescuing 6 men who were on the wreck breaking her up. The Manacle Rocks, located about a mile off the E. coast of the Lizard peninsula, 'have taken a terrible toll of ships over the years, with 400 victims buried in the church yard' (at St. Keverne). But Lowland Point is, I believe, on the nearby mainland. WWW data about Gap seems to be quite limited. Can you help any? A cargo ship. Per 1 (data & giant image, Papalera), 2 ('convoyweb.org', WW2 convoy duty, click on 'SHIP SEARCH' then insert Almenara), 3 (modest collision, Cicero, at page bottom), 4 ('plimsollshipdata.org', Lloyd's Register data, 1930/31 thru 1944/45, Almenara), 5 (Miramar, link, you now must be registered to access). 260.1 ft. (79.28 metres) long perpendicular to perpendicular (or maybe 260.2 ft.), especially constructed for the Norwegian general trade, speed of 10 knots (or maybe 8 only), signal letters LCTW later GSYV. Built for D/S I/S Garonne, of Christiania (Oslo), Norway, with Fearnley and Eger the managers. In 1929, the vessel was sold to 'Mossgiel Steamship Co. Ltd.' ('Mossgiel), of Glasgow, Scotland, John Bruce & Co. or John Bruce Junr., the managers & owners, & renamed Almenara. Mossgiel is noted for naming its ships with a name that had the letter 'a' as its first & last letters. On Apl. 4, 1929, Almenara was in collision with Cicero, a Hull trawler. There was little damage to either vessel. 38 WW2 convoy references, including at least 5 N. Atlantic crossings, service in the Mediterranean (Alexandria, Bizerta, Algiers), West Africa (Freetown), Caribbean (extensive), U.K. coastal, & one voyage to Reykjavik, Iceland. On Aug. 18, 1943, Almenara joined convoy KMS.23 in progress for her voyage from Algiers to Bizerta, Tunisia. Some weeks later, she would seem to have left Syracuse, Sicily, for Taranto, in southern Italy, with 84 aboard, I read, & a cargo of Government stores & munitions. On Sep. 20, 1943, the vessel hit a mine 25 miles SSE of Taranto. At 40.15.1N/17.16.3E. 41 lives are said to have been lost. But the crew/passenger numbers seem to be confused. Why? I read that on Sep. 21, 1943, Motor Torpedo Boat 89 found 2 rafts crowded with Almenara survivors, & helped by an Italian flying boat, ended up with 52 Almenara survivors aboard. Those 52 were transferred to Landing Craft LCI(L)6. I am not sure where they were landed, likely at Taranto. If both 52 & 41 are correct Almenera must have had 93 aboard her rather than 84. I have not spotted the name of Almenera's Captain at the time of her loss. Did he survive the disaster, I wonder? WWW data about the vessel is modest. Can you help any? An image? In this spot, I will add in some of the more unusual names of vessel's registered in Lloyd's Registers. An example is the many vessels named Why Not? Will add more names here as I come across them. Often there were more than a single vessel of a particular name. In the latter half of the eighteenth century, the Naisby family were farming at Crawcrook, a village on the Hexham road, just west of Newcastle, close to both the Tyne and the Roman wall. Robert Naisby had three sons, John born in 1771, Roger in 1773 and Robert in 1774. When Roger was twenty-one he married Mary Forster, also twenty-one and from Whitehall, near Chester-le-Street and they settled to farm at Sacriston, a small exposed town, perched on a ridge, a few miles north-west of Durham. Here three sons were born to them in rapid succession: in 1796, a year after the marriage, William, then Thomas in 1797 and John in 1798. There is very little that I have been able to uncover about William�s early life, but it can be assumed that not wishing to follow his father as a farmer, he worked his way up through the shipbuilding trade, as a shipwright then a foreman and, eventually, a master builder. During this time he had met a girl called Ann Elizabeth Bulmer from Staindrop, presumably a relative of his partner Bulmer, and they were married at St. Paul's, Jarrow, on the 8th of March 1829. By the 1830s they had settled in South Hylton on the Wear, just west of Sunderland. Here, in 1836, he took over a yard from William Gales, which formerly belonged to Edward Potts. By now, he had a three-year old daughter, Mary, who had been born at South Hylton. The yard rapidly appeared to gain momentum and prestige and many medium-sized barques were built there, the first four of which were launched under the names of Naisby and Partner and the next two under the names of Naisby and Bulmer, so it is quite possible that he had been in partnership with Bulmer since 1836. After 1836 though, the barques were launched under his name alone. His early life may have been closely mirrored by another shipbuilder in South Hylton, a man whom he knew well for the rest of his life: George Bartram. George was the son of a carpenter; he had been orphaned when young and was apprenticed at the age of eleven to William Gales at South Hylton. He then worked as a foreman for the Dryden shipbuilder, Beddick, from 1822 to 1831 and finally started as master-builder at South Hylton in partnership with John Lister in 1838 though, according to the Customs House registers, he had been in partnership with J. M. Gales in 1828 and had launched the �John Craig�, a small craft of eighty-six tons, under the name of J. M. Gales and George Bartram, builders. He had married Margaret Appleby and his family were close contemporaries, neighbours and maybe relatives of the Naisbys. However, he was not to be so fortunate in his domestic life: he lost seven sons at early ages, all buried in the South Hylton churchyard and then lost his son, George Appleby, at the age of twenty. George�s professional life, though, was more successful. He was on his own at South Hylton and by 1865 he had brought his only surviving son, Robert, into the business and so founded the firm of Bartram and Son which was to continue as a family firm and become one of the most famous firms on Wearside until its closure in the 1970s. By 1851 William Naisby was living with his family at Ford Dockyard House.� He had eleven men working for him, had launched twenty-one ships, mostly barques, and now had three daughters:� Mary (18), Ann (13) and Elizabeth (9)�and it is possible that, by now, his nephew, George Naisby who was living in South Hylton, was one of his employees. He certainly was in 1869. Another nephew, Thomas Forster Naisby, may also have been employed by him and was now living in the neighbouring village of Pallion. Thomas�s son, another Thomas Forster Naisby, was still launching ships on the Wear in 1953 at the age of seventy-six. Very soon William and Ann�s daughters were to be married, all to men who made their livelihood from the sea: Mary to Richard Southern Burkett, a master mariner in 1855, Elizabeth to Thomas Pratt, the son of a boat-builder (though the marriage was brief because he died sometime before 1867) and the alliance between the Bartram and Naisby families was further cemented by the marriage of Ann to Robert Appleby Bartram, George�s son in 1859. The world of shipbuilding too had been expanding and consolidating for in 1853 the Wear Shipbuilders Association had been formed. William joined them in 1854 and was present at a dinner on January 5th at the �Crown and Anchor� to celebrate the inauguration. Later both George Bartram and his son, Robert, became members and, eventually, Robert became Chairman. In 1856 William was on a committee to investigate how the Tyneside Shipbuilders' Association operated so that the Wearsiders could organise themselves on similar lines. In the same year, it was proposed that the Hylton shipbuilders should amalgamate with the Sunderland shipbuilders, a merge that could produce more solidarity and security for its members. For instance, they decided at a meeting in 1857 to standardise the wages for the men throughout the Wearside docks and proposed a reduction to four shilling and sixpence per day per man. By 1861 the Association was strong. William was now sixty-six but was still working at his shipbuilding though he seemed to attend more dinners held by the Association than meetings� Grandchildren were being produced by his daughters and he must have been flattered that two of his daughters called sons after him: William Naisby Burkett and William Naisby Bartram. He had fine portraits painted of himself and his wife and he was known as 'a prominent man of fine face and figure who looked well on the election hustings'. He had now built at least thirty-three ships and was due to launch another seventeen before his death. In Linton�s list of 1863, Reay and Naisby were on the west docks and Robson, Proudfoot and Claxhough were at the next yard to the east. William�s daughters were not blessed with the best of fortune. Mary Burkett lost her husband, Richard, at sea at the age of forty-seven, rather mysteriously, and the first mate brought the ship 'Brightest Star' back to port. She bore seven children, three of whom were to die under the age of four. Ann Bartram bore three children then died when her son Willy was only eight. Elizabeth Pratt lived to the age of fifty-nine but had been widowed early. William himself died at the age of seventy-one on Christmas day, 1871 and with his death the shipyard closed. Two years later, his wife Ann died at the same age and they were both buried in the Bishopwearmouth cemetery. From small beginnings, he had created a shipyard that had become much respected in its own time. He had launched at least fifty ships, mostly barques, and on his death left nearly �10,000 in his will for his family. He was one of the founder members of the Association of Wear Shipbuilders and had created an interest in shipbuilding that was to continue through another three generations of his own family. But what of his descendents? His son-in-law was to become one of the most prominent citizens of Sunderland and was eventually knighted for his services to the community. Four of his surviving grandsons were quite notable sportsmen: William Bartram became captain of the Humbledon Rugby XV and the star player for the side usually was another cousin, Harry Burkett � and the two cousins were the greatest of friends.. They both also competed in cycling competitions and in 1881 Harry Burkett and his brother, William Naisby Burkett, came first and second in an amateur prize over a distance of ninety miles. George Bartram, their cousin, was also interested in cycling � for twenty years he was President of the Sunderland Cycling Club. Harry Burkett was to crown his sporting career by being chosen for the County Durham Rugby XV in 1887. Harry started his career in Bartram�s yard with his cousin Willy but left after a few years to join the civil service in H M Customs and Excise though his brother Willy was in shipbuilding for the rest of his life. George and Will Bartram were taken into the firm by their father. He outlived them both and it was George�s sons, Robert Appleby and George Hylton who took over the reins after his death. Mercia (later Bille, Santa Chiara, and Bravo) a partial history of the vessel can be read here. Of the above, the Clan MacLeod was described as a smart iron barque which did good runs under her later name of James Craig. She was still on the registers in 1924 but dismantled in 1926. George Haswell retired in 1889 and Sir Robert Bartram was joined by his sons George and William Naisby and ran as Bartram and Sons, South Dock.